2016: Elation at getting a Jetta TDI with 150 bhp. It was a beautiful car, but in retrospect looked a tad too understated to be honest. But the drive was good. 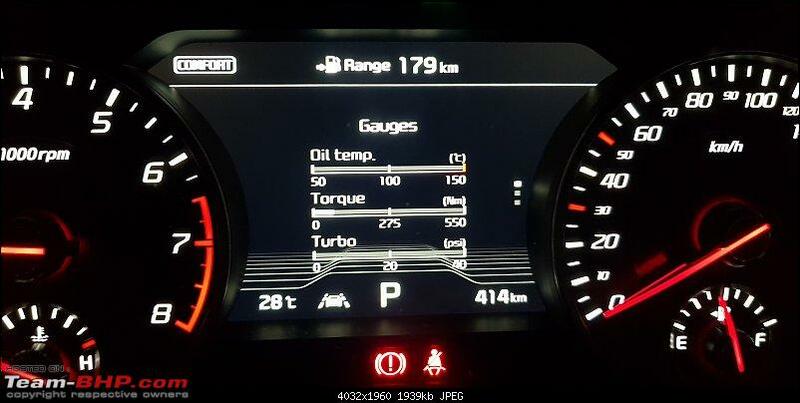 Coming from an i10 and an i20, the handling was miles better, and I was impressed at the power off the line for a car so big. 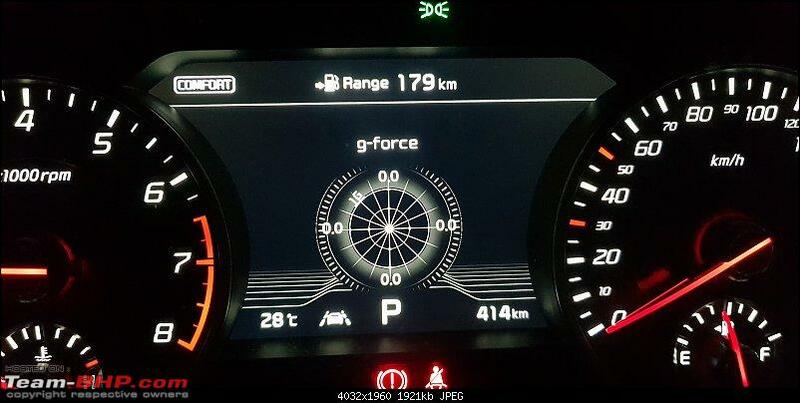 Drives to Mysore and Chennai were no longer stressful knowing that we had a safe car which was stable at expressway speeds. I also enjoyed driving even in Bangalore's traffic during peak hour. (Yeah I am weird that way). End of 2017: Change is afoot. A big change in my settled life in India. I had applied for a move to Australia which came through, and I was planning to move by the start of 2018. Transferred the Jetta to another colleague, and wandered around in an Uber for a few weeks. Ugh, the way these cabs maintain and drive their cars. Made me miss my Jetta even more. August 2018: Moved to Sydney, settled down, and aimed at getting my driver's license soon. After a lot of preparation and a few classes, I was able to clear the drivers test in the 1st attempt, and was able to get my Indian license converted to a full license in Australia. I did not have to go through the process of getting a learners license etc here. September 2018: With whatever money I could save up, I bought a 2010 Skoda Octavia vRS. Peppy little car, but was showing its age. Suspension was dodgy, and the clutch was shot. Getting them replaced would have put me over my budget. So decided to hold on to it for a while, in the hope that I could get a new one come 2019. January 2019: The time has come! I start shopping around (mostly window shopping) at the range of cars I could afford, and a few I could not afford as well. - Australia rejected the new Commodore which was a far cry from the home grown previous generation Commodore. - An enthusiastic driver wouldn't like the drive and the comfort. - Technology is at the industry's best. 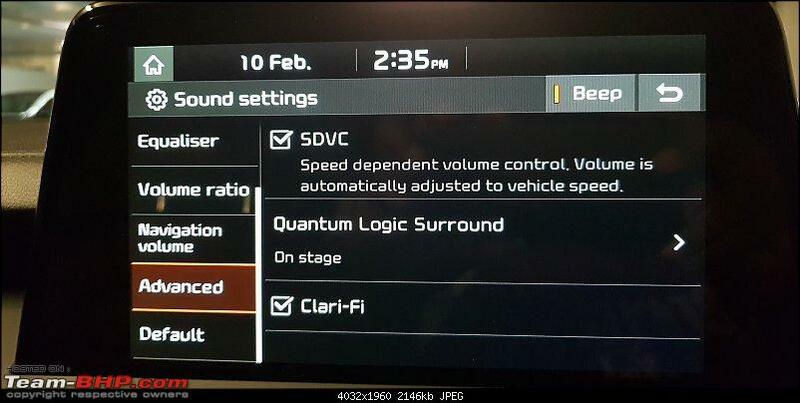 Has the new VW industry first of varying the speed, and automatically bending lights based on the navigation map just before the curve arrives. 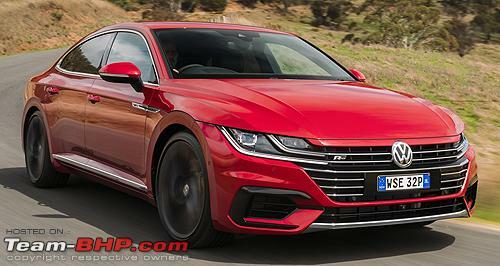 - Passat like interiors even though this car is at least $20000 costlier. - Un-engaging drive. Will make a beautiful chauffeur driven car with the ample rear legroom. But to drive, nope. - Utilitarian 4 cylinder engine. Does not excite. - Sales dealerships were acting as if I should be grateful to them that I get to buy a Mercedes, and this put me off. - It was an SUV. Maybe next time. It must be evident by now that I wanted a sedan even though the entire world seems to be going towards SUVs. I also wanted something more unique compared to a BMW or a Mercedes. I wanted a coupe design to to make it look beautifully. 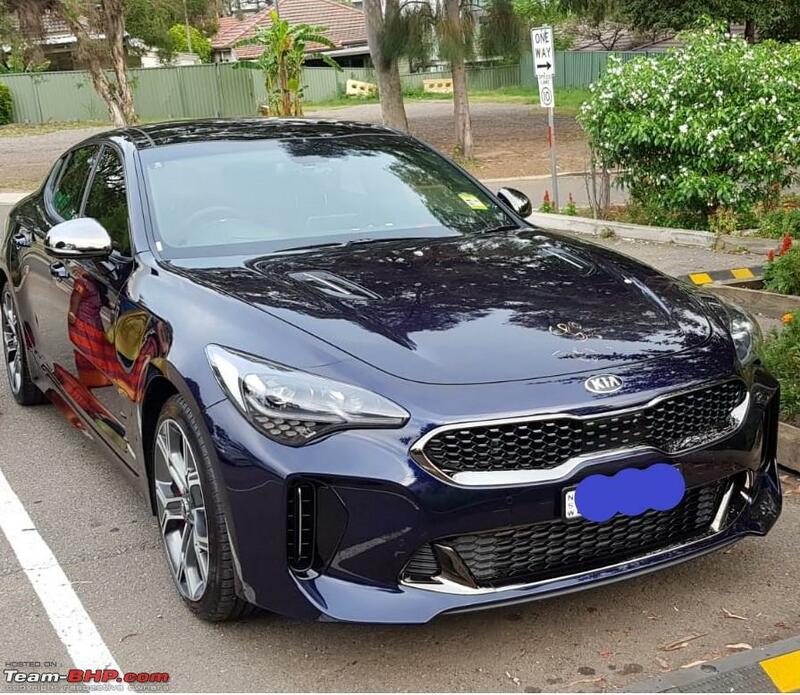 I had noticed a few videos of the Kia stinger on YouTube, and was aware that the reviewers were praising it, calling it the best car of 2017/2018. 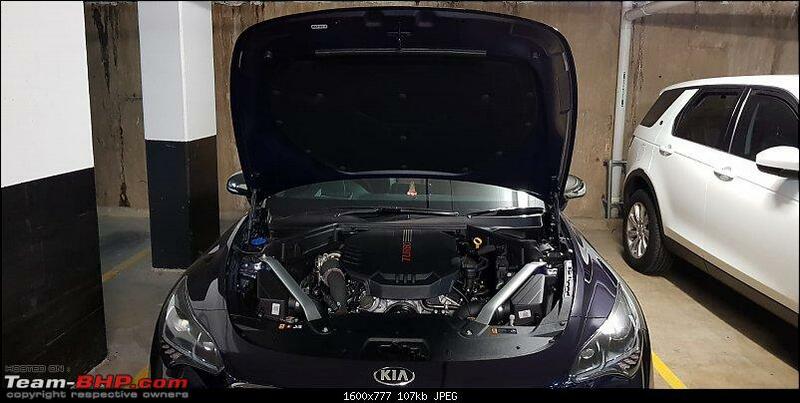 But I until this time I had not started looking at it in all seriousness since, honestly, "It was a KIA". But then everything changed when I saw the car in person. It looked much better in person especially in the deep chroma red color. It was anything I had not seen till now. I then started actively making an effort to look at Stingers on the road. But I just couldn't find many. Maybe 1 or 2 in an entire week or fortnight. It was so rare, it's like a cheetah sighting in Bandipur. But still it was backed by a 7 year warranty, and so it was not going to become a lemon pretty soon. - 500 Nm of torque available from 1500-1800 rpm allows you to zoom off from the stop sign. - No way to figure out which gear the automatic transmission is on at any moment, or I haven't figured it out yet. 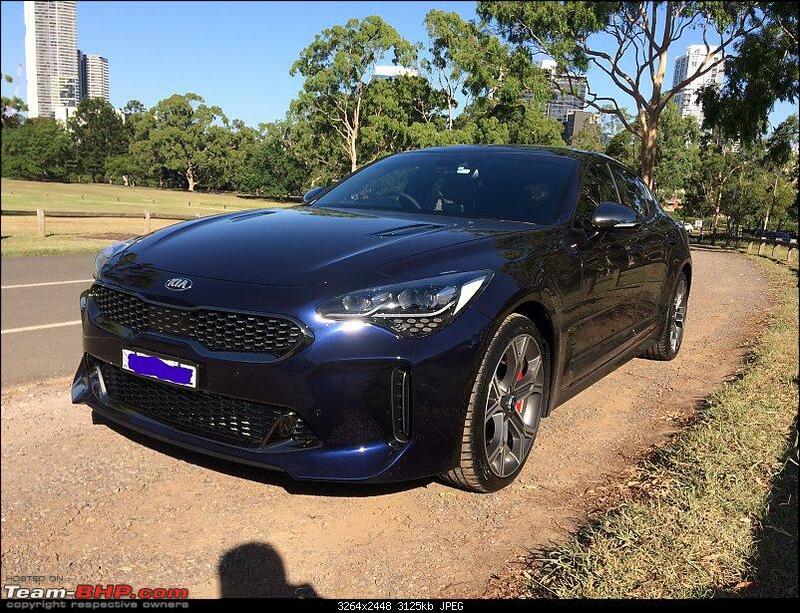 The Stinger provides most of the safety and comfort features at a price which is a couple of thousand dollars below the starting price of equivalent German cars. These safety features when optioned on the Germans would cause the price to jump up, and in some cases up-to $40,000 more than the Stinger. The Stinger is a handsome car from whichever angle you look at. It has good street presence, with it turning heads wherever you go. The good looks carry on to the interiors as well, making it a well rounded package. It has a plucky underdog feel to it and you immediately find yourself endeared to it. The Stinger becomes a part of your family. It has character, and makes you have character. Being designed by Peter Schreyer previously of Audi, and the handling and the ride being governed by Albert Biermann previously the head of BMW's M division, only gives more confidence that this car has been done right. 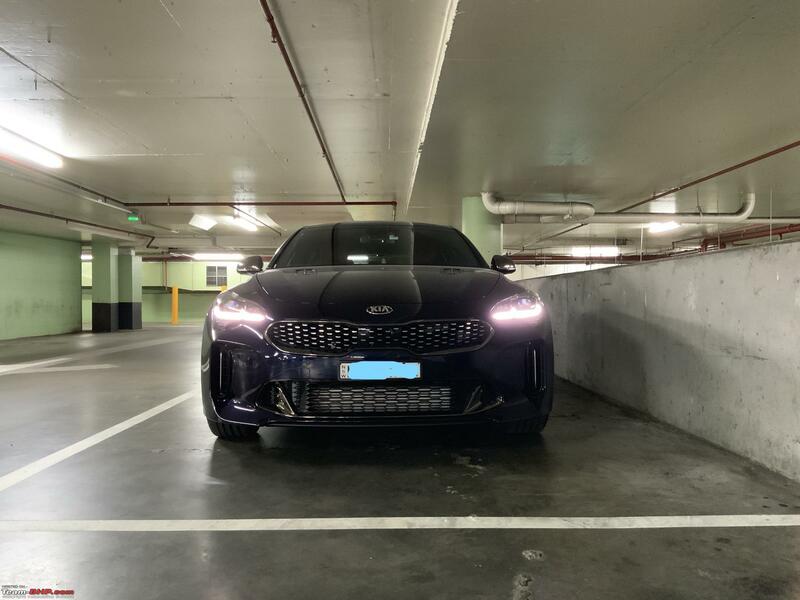 There are several reviewers who have actually gone out and bought a Stinger as their daily driver, which doesn't happen that often. The multitude of awards the Stinger won in 2018 is nothing to sneer at. Even the awards it did not win, it was right up there with the finalists. 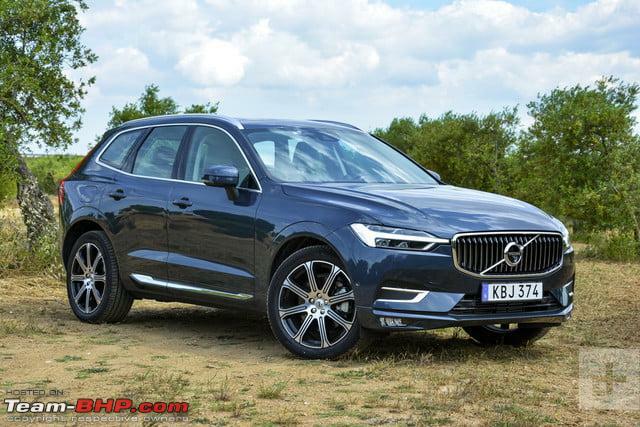 And there too, it was out done with the XC40, and it is no shame losing to the XC40. This car also ticked all the following boxes which were my main criteria in my next car. I put down a $2000 dollar deposit and asked initially for a Aurora Black Stinger with Red Leather seats. However, none of the dealers in Sydney had one in stock and they had to put in an order for it. 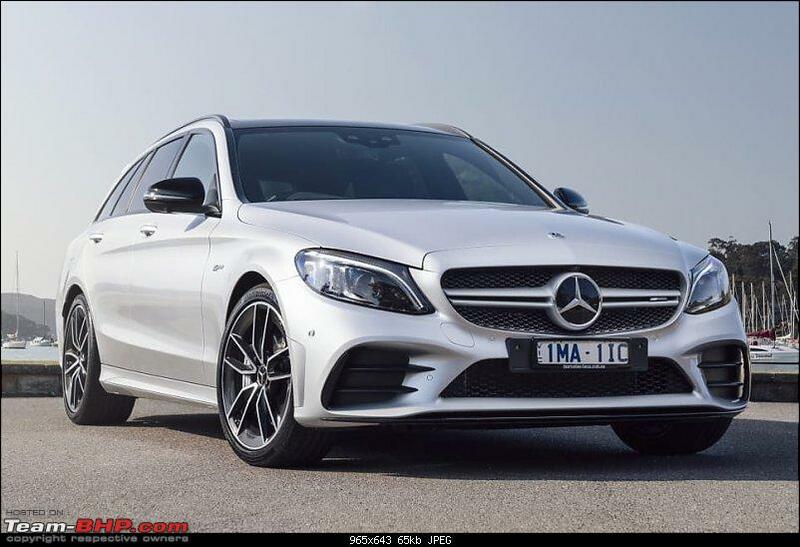 The Australia bound cars are manufactured in South Korea, and was told that I will have to wait 3 months for it to get here. I still had to get my finance sorted out and got that done in a week or so. While doing so, I found another dealer giving me a better price for the invariably the same car coming down from Korea in three months time. I bargained with the original dealer, got him to match the same deal, and add in ceramic coating, carpet mats with GT embossing, and front and rear dash-cams. Once the finance was sorted out, and the invoicing was done, I get a call from the dealer the next day. 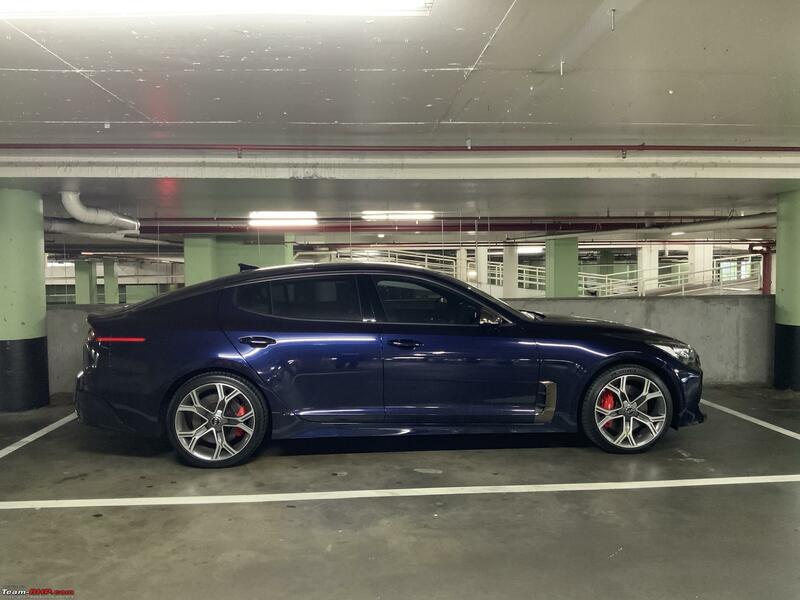 The miraculously have a Deep Chrome Blue Stinger GT, MY19 in stock, and I was called in to have a look at it. I did so after a week, and see that it has run only 4 km. I like it, and somehow liked the blue better once I see it in person. I finalize it, and am ready to take delivery of the car in a week. 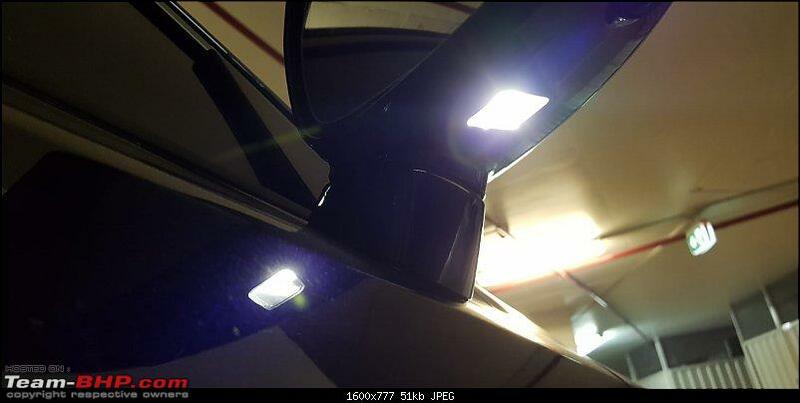 The week goes by with the dealer installing the dash-cams, and getting the ceramic coating done. I did not take any extended warranties since KIA already offers a 7 year warranty, with the maintenance costs capped and already listed out on their website. 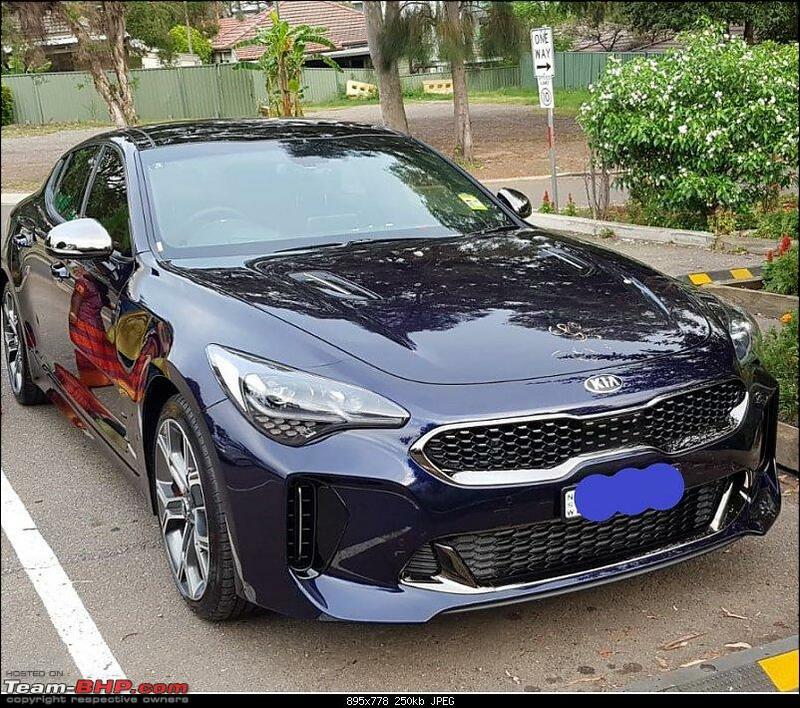 In a week's time, I took delivery of a Deep Chroma Blue 3.3 GT, the top trim, and the top model that KIA Australia has to offer with 7 km on the odo. The way this car looks gives it a lot of street presence. 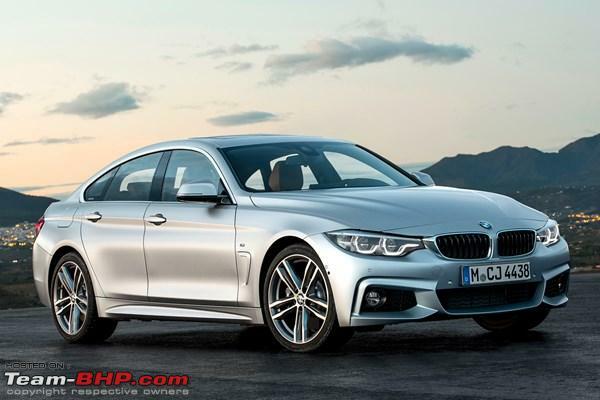 With a ground clearance of 130 mm and width which is bigger than a 5 series BMW, it is really a looker. 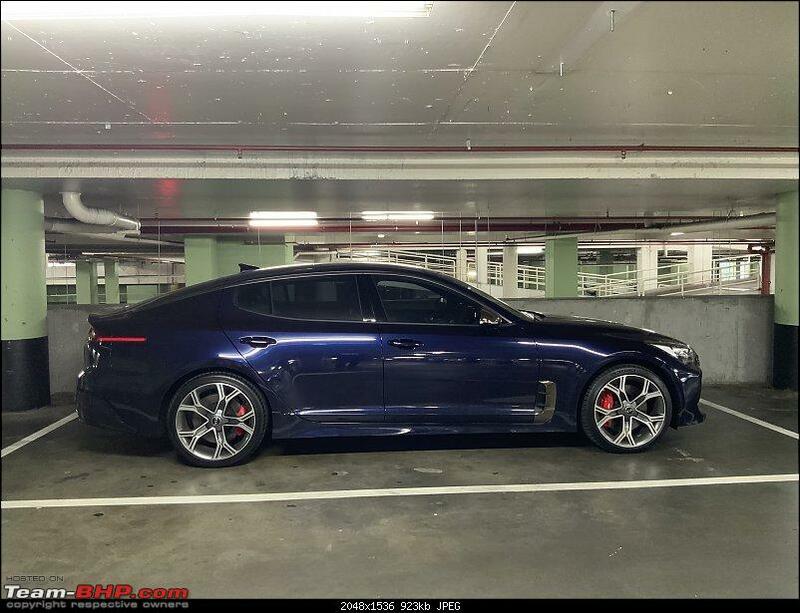 The Stinger is set to compete with the likes of the BMW 4 series Grancoupe, and the Audi A5, but it's dimensions are closer to the A6 or the 5 series. Wheelbase is 2905 mm. The colour is peculiar. It looks a very dark shade of blue in the dark and under artificial light, but looks a brilliant violet under direct sunlight. Aggressive front end, unique and not really anything we have seen in the recent past. 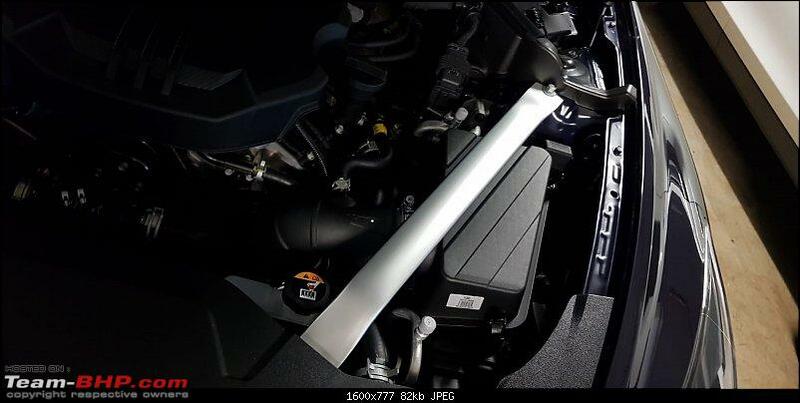 Modified version of the KIA tiger nose grill, with a wide air dam for the inter-cooler. 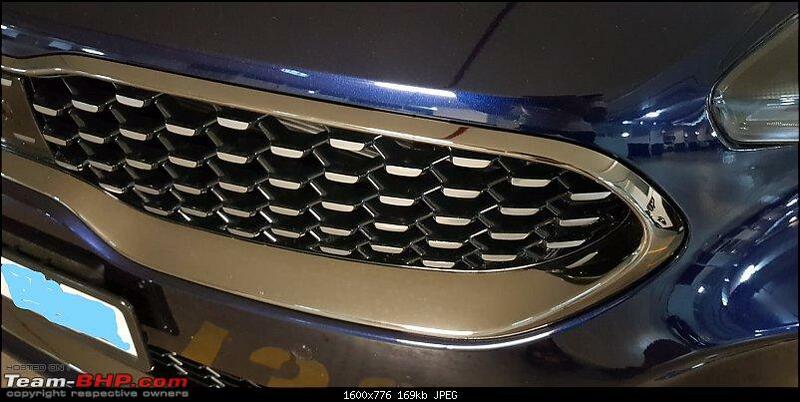 Also notice the hexagonal pattern of the grill. The radar for the adaptive cruise control is neatly integrated with the same design, right at the notch of the 'tiger nose'. Prominent front skirt helps funnel air into the air intakes. In my opinion the front three quarter view is the best angle to view the car from. You don't normally expect such edges and curves from a mid size Kia. Hood intakes are fake and just add a cosmetic appeal to the car. Totally real front air intake which funnels in air to cool the front brakes. Notice the rear air vent. The front air intake and the rear vent help in cooling the front brakes, and also help in aerodynamically adding that little bit more down force. The colour dramatically changes when viewed in artificial light. Rear three quarter view shows the hood swooping towards the tail in a coupe like design. Notice the extended side rear reflector which does not fit in with the rest of the design language. Seems like an after thought and I am not a big fan. Side profile further accentuates the fantastic coupe design. Also notice the blackened chrome running along the body of the car over the window line. A kind of blackened, smoked out chrome is used on the grill and the mirrors. Looks much better than the normal chrome which is used on other cars and looks classy. It's better than "black" editions manufacturers use on the mirrors on their limited editions. Also, close up of the grill design. The ORVMs automatically fold when you lock the car, and open out automatically when you walk up to the car when it senses the key, as a way of welcoming you. ORVM is wide and large enough. Combined with the rear blind spot detector and with the 360 camera for the reversing, switching lanes or parking is not a strain at all. The Stinger runs on a 19" staggered setup with 225/40 in front and 255/35 at the back. 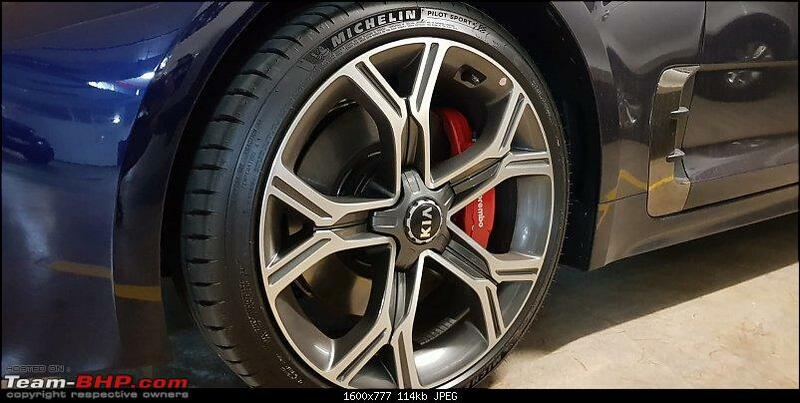 The wheels are draped with Michelin Pilot Sport 4 tires. 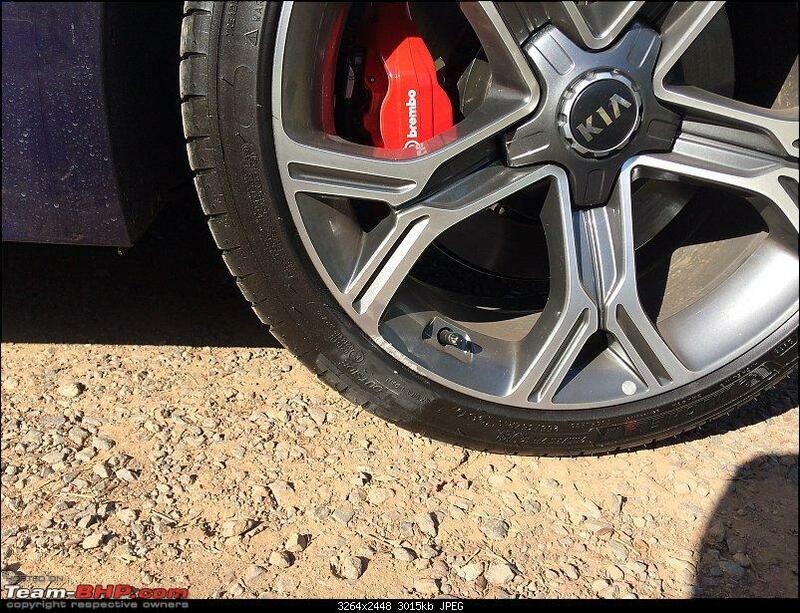 (Used to come with Continental tires in 2018, but KIA changed them due to excessive wear). A disadvantage of the staggered setup is that a 4 way tire rotation is not possible, and that reduces the tire warranty by half. Close up of the disc brakes used on all 4 wheels. 4 piston Brembo brakes in front and 2 piston Brembos at the back. The central "wheel nut" is a fake plastic piece, which when pried open reveals 5 normal wheel nuts. Aargh! Curb rash. The low profile of the tires means it's easy to get the alloys scuffed when parking too close to the curb. 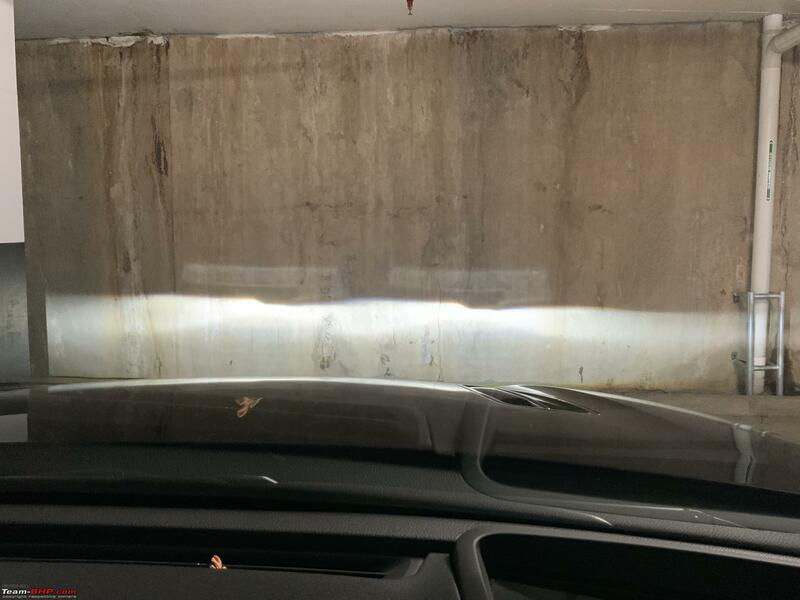 In my instance, i was when going forward in a parking lot where i went too close to a ledge. Maserati inspired tail lights with a red bar running right across the rear help to create a busy rear which works. There is a slight notch type rear spoiler as well. One of the nicer rear ends on a car in a while. The quad exhaust tips are genuine with twin reflectors above them. Stinger emblem on the left and GT logo on the right. This is the only position where the stinger name is mentioned. Every other place has a KIA logo. Notice the shark-fin antenna which takes up duties of communication for the navigation system, and the satellite radio. The rear tailgate is a hatchback. Though the rear windscreen looks large, it's pretty small from the inside and hinders visibility. However, there are no bag hooks in the boot. Only contains hooks to hook a boot net under which shopping bags can be put into hold them into place. Under the boot mat is a space saver spare tire. Odd that the main tires are Michelins, but the spare is a Kumho. The space saver is a 135 R18 which is rated for 80 kmph maximum. The tools are encased in a foam casing which is the norm nowadays. The tailgate is a smart tailgate which opens after 4 seconds of detecting the key next to the boot. 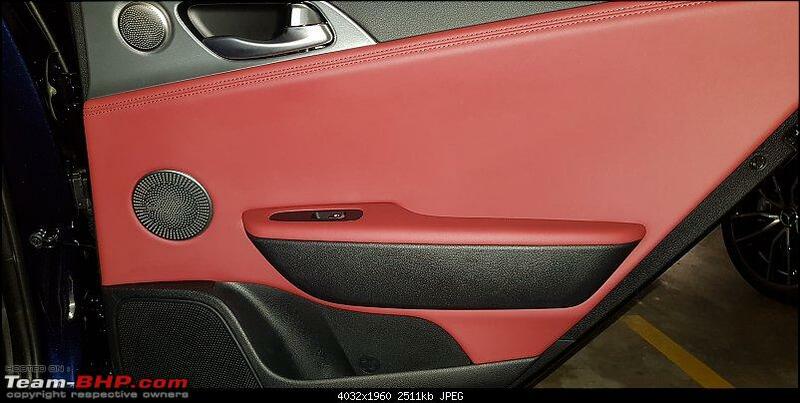 Automatic hinges help in opening the hatchback and uses a button which you can push to close it back down. There is not separate button to lock the car along with closing the boot. However, If the smart tailgate opens with the rest of the car being locked, when the boot is closed, the rest of the car remains locked. Also present a larger than average sunroof. 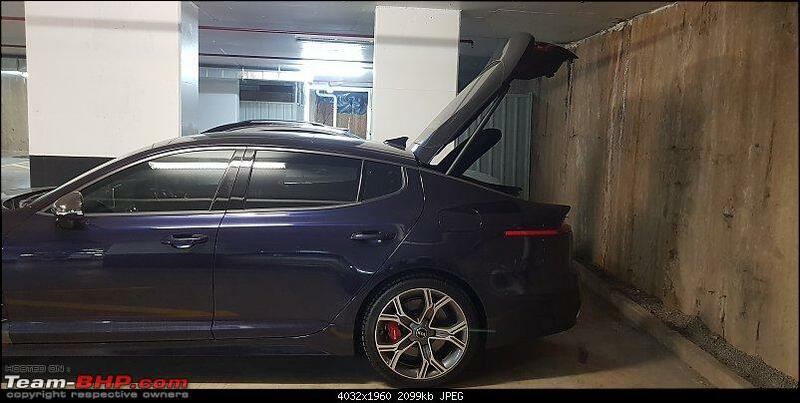 KIA states that having a panoramic sunroof would have compromised structural integrity of the car during cornering, and this sunroof is the largest they could have possibly fitted. 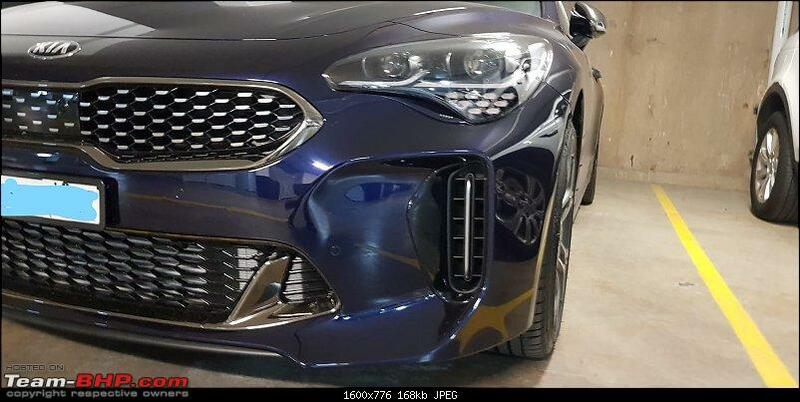 Panel gaps are uniform throughout and resembles the fit and finish of high quality Hyundai and KIA models which are currently present on the market. 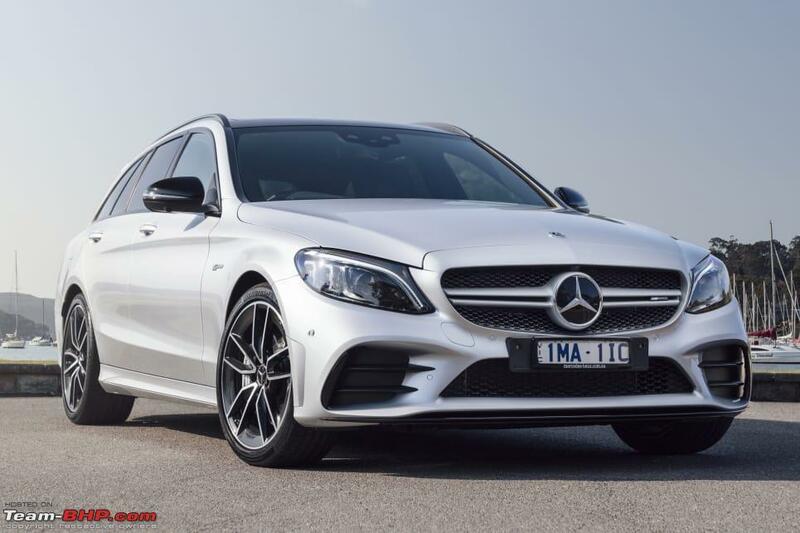 The styling is on par with the German counterparts and could easily stand heel and toe with any of the luxury brands out there. 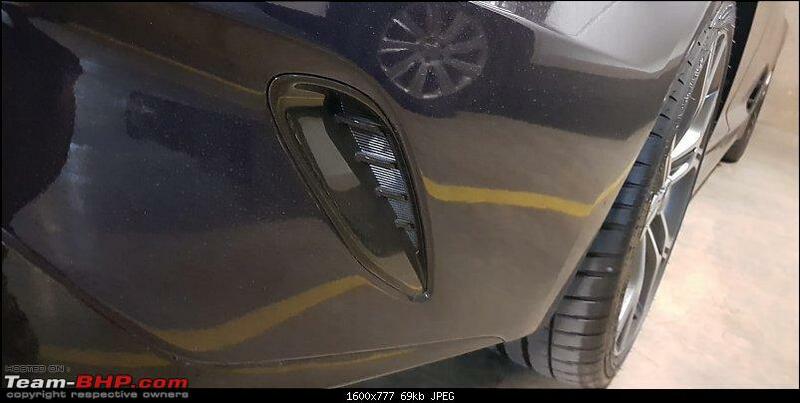 There have been however complaints about paint quality in 2018. The Sunset Yellow painted KIA Stinger was infamous for being recalled for a repaint throughout the world. Only around 70-80 were sold in Australia and then this colour was discontinued. 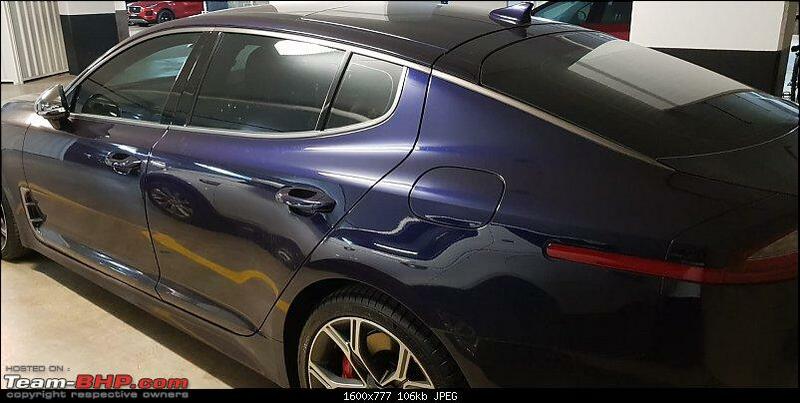 The Deep Chroma blue seems to be the best colour in terms of paint quality with least number of issues reported, and here's hoping that 2019 KIA Stingers have these issues corrected. My usage is around 40 km per week as I travel by public transport most of the days. On weekends, the Stinger is mostly driven on the highway. Mileage around the city is paltry at 7 kmpl which goes up to 12.5 kmpl on highways. Last edited by bharat4ever : 11th February 2019 at 05:15. The headlamp cluster is a complicated arrangement of LEDs. The level of detail is staggering. So will the price be to replace one headlamp unit. The high beam and low beam headlights are LEDs inside projectors. They are dynamic bending lights which turn along with steering input. They work well all the time and are exaggerated in their approach where they swivel back to their normal position after the curve is completed and the steering is returned to its neutral position. This noticeable motion is a novelty factor and a party trick which doesn't wear off soon. The headlamps are auto adjusting with respect to throw. At slow speeds the light may illuminate only a small distance ahead. But with speed, the height increases to illuminate further ahead. 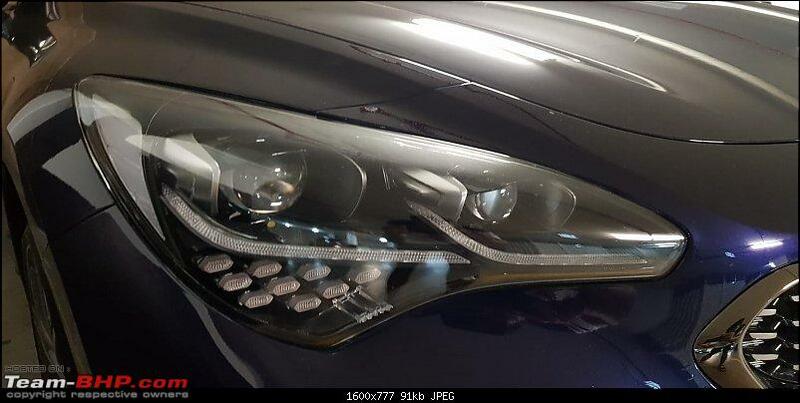 The Stinger also has auto high beam which switches on the high beams when the road ahead is completely dark and there are no oncoming vehicles. The high beams are automatically switched off if traffic is detected in the opposite direction. No fancy A6 type switching off individually LED arrays though here. 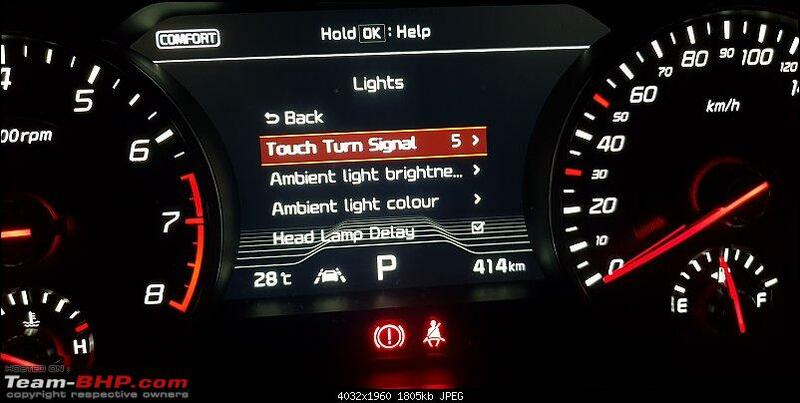 High beams can be manually switched on as well. Daytime running lights are bright LEDs with the indicators below them. The indicators are 9 LEDs arranging in a fighter squadron type arrangement. The same arrangement is also present in the rear blinkers as well. With headlamps switched on vs with only DRLs switched on. 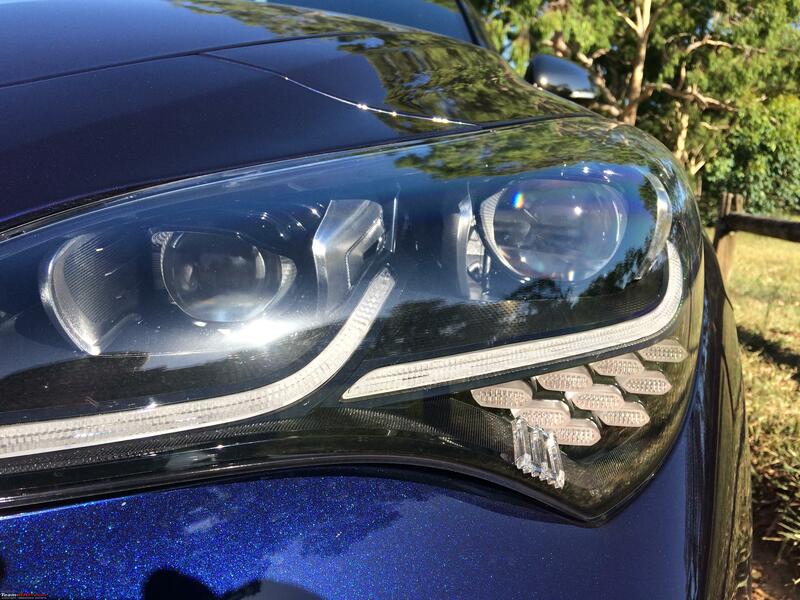 DRLs stay on even when the headlamps are switched on, albeit a bit dimmer. The throw of the lights is more than adequate, but there are weird notches in the light beam from the design of the projectors. Slightly distracting, but hope one would get used to it. Even more distracting since the bending lights move the notches as well, and you will definitely notice. Tail lights look cool and unique to follow. 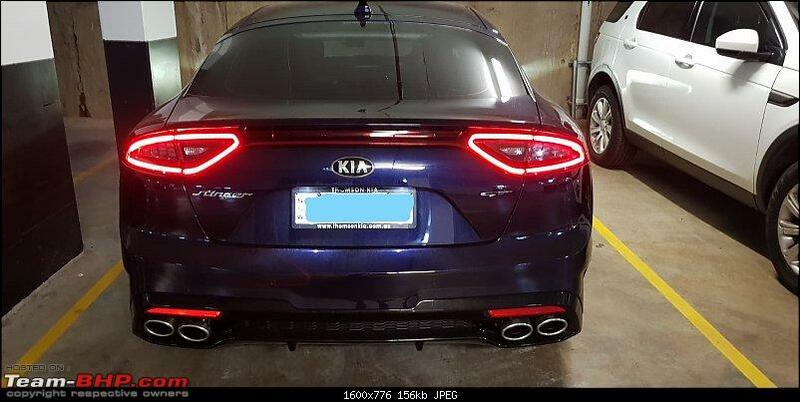 The same outline of the tail lights illuminate for the brake lights as well. Enclosed within them are turn signals and reverse lights. 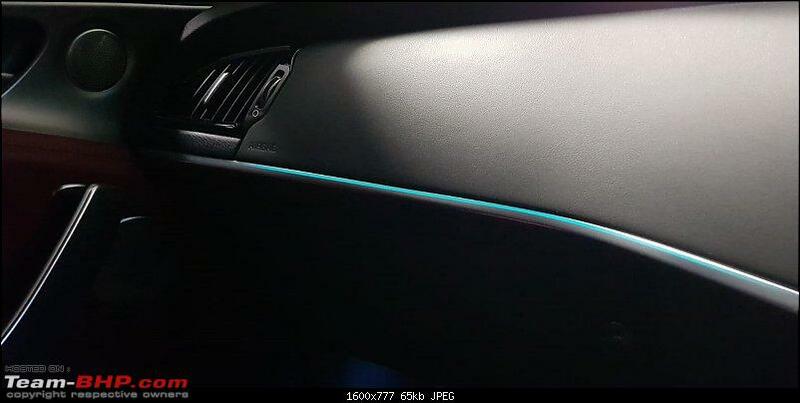 The car has ambient lighting which runs as a small strip of light across the dashboard on the passenger's side. 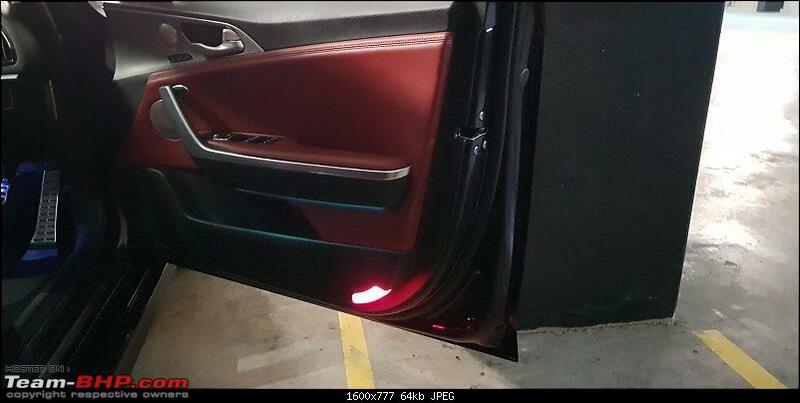 Ambient lighting also present under the arm rests on the door. Notice the green color in the below picture. 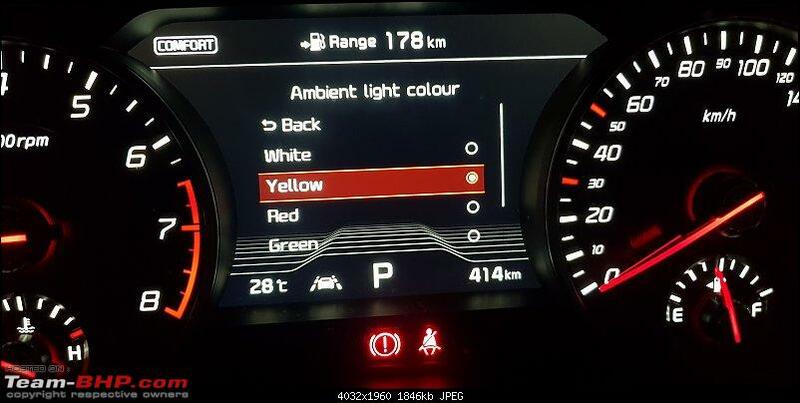 The ambient lighting color with adjustable with White, Red, Yellow, Green, Blue and Purple as the options. Other than Purple and Red, the other colors don't exactly stand out. The foot wells get a more somber white lighting which stay on until the car is started. 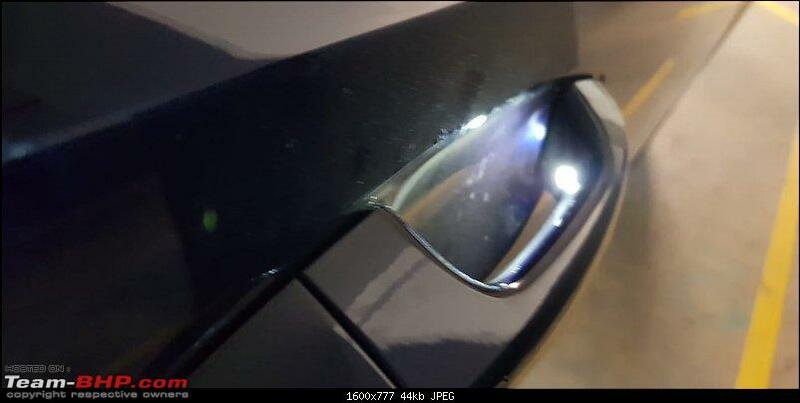 The car also gets door handle lights and puddle lights below the rear view mirrors. The first thing you notice as you step into the Stinger is that everything you see and touch feels premium. Soft touch plastics and aluminium generously adorn the cabin. Even plastic switches are premium to touch, but they never reach the heights of an Audi or a Mercedes. 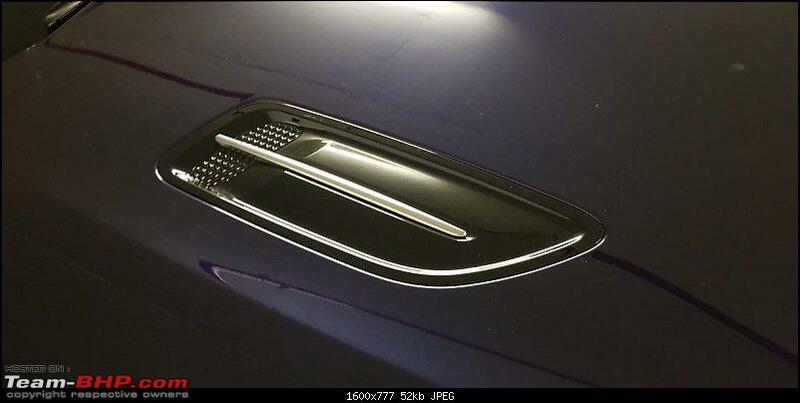 You will have to look lower down at the plastics of the door pockets to get hard scratchy plastics. 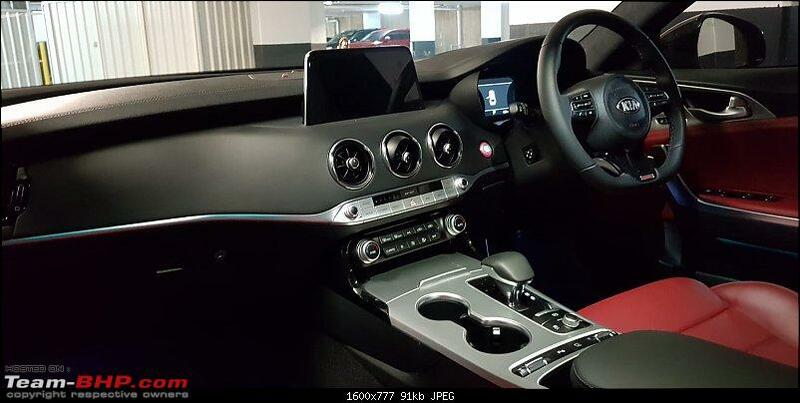 Note the aluminium outline on the cup holders and the aluminium waistline running across the dashboard creating a refreshing change to black interiors. Also note the electrical adjustment on the steering wheel. 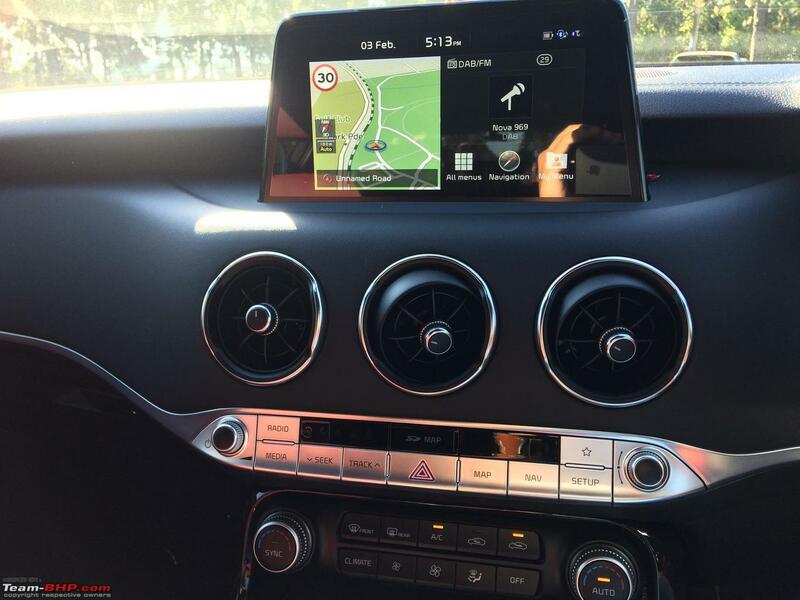 The infotainment system is displayed via a popup screen mounted on the eye line like the counterpart German cars. The center air vents are clearly lifted from a Mercedes' cabin. A swivel wheel controls the airflow on each vent and has a satisfying click when it shuts off the airflow altogether. The same design of the center air vents carry over to the rear vents as well. Under the rear vents there is a 12 V socket and a USB charging port. 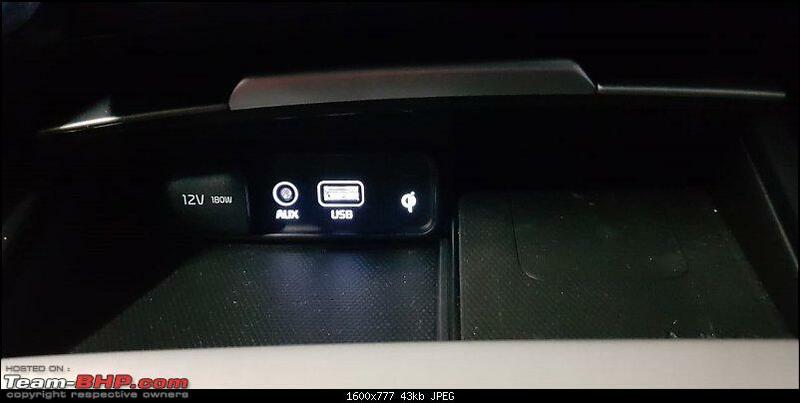 The USB port at the back is only a charging port which cannot communicate data to the infotainment system for Apple CarPlay / Android Auto. 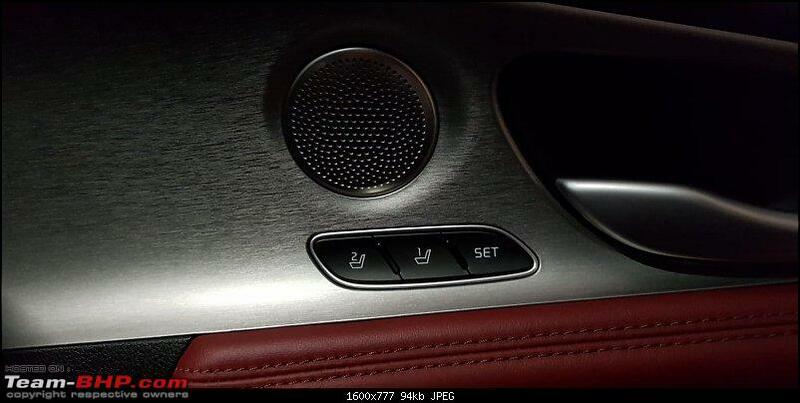 Note the temperature swivel wheel which can be used to independently adjust the temperature for the back seats. 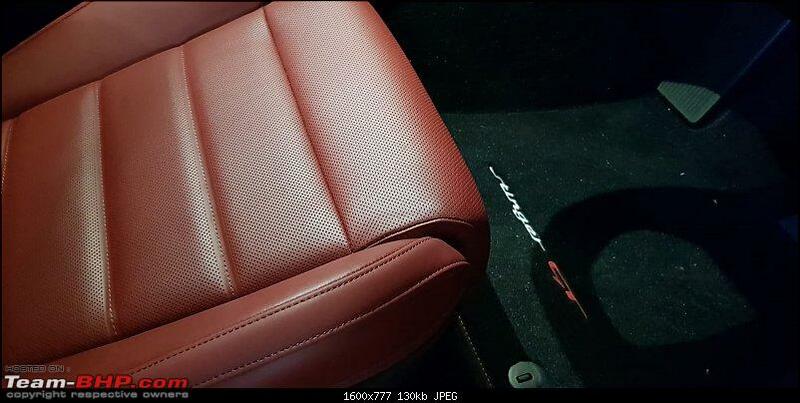 Upholstery comes in the form of Nappa leather which adorns the seats. 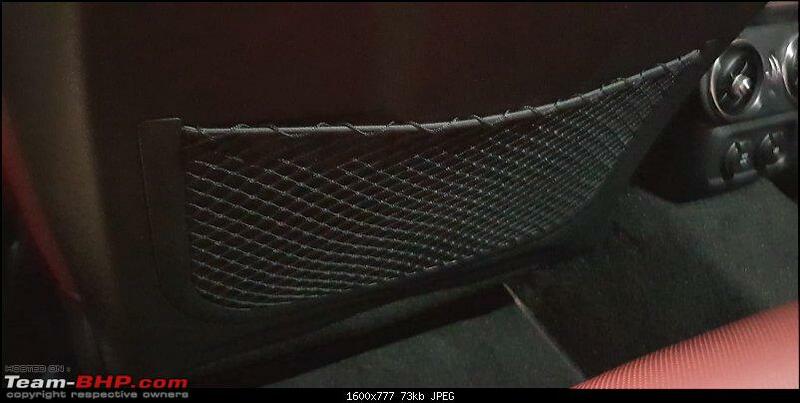 Leather is also used on the center arm rests, the steering wheel, and the doors. 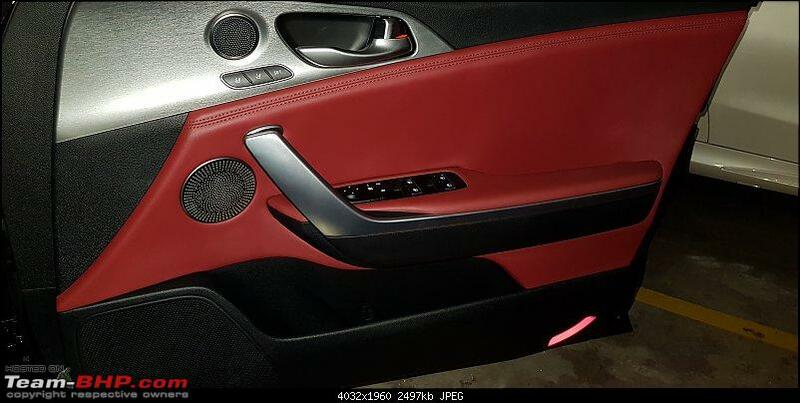 The red leather which this Stinger comes in gives a good contrast between the black and aluminium present on the door panels. 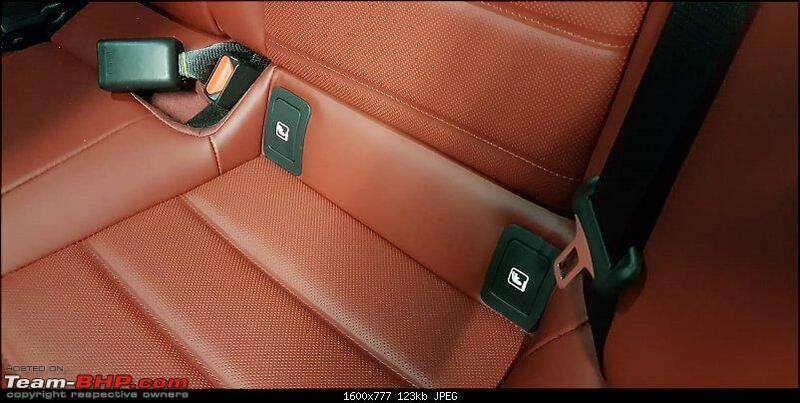 The seats are comfortable with multi way electrical adjustments. The driver's seat comes with additional under thigh support and side bolsters support. The side bolsters can be tightened to hold you tighter when cornering when driving 'spiritedly'. Unfortunately the bolsters seem to be made of leatherette and are prone to wear and tear. KIA however provides a free replacement of the seats once during the 7 year warranty period. Note the under thigh support retracted all the way compared to the previous picture. The driver's seat gets two memory positions which can be saved. The memory records the position of the seats, the steering column, the under thigh support, side bolsters, Heads up Display position and ORVM positions. The seats also move out of the way when the car is switched off and the driver door is opened. The seats move all the way to the back, the steering column rises up for easy exit. The reverse happens when you get into the car and close the door returning the seats to the last memory position. Each door gets a tweeter, a mid range speaker and a woofer. 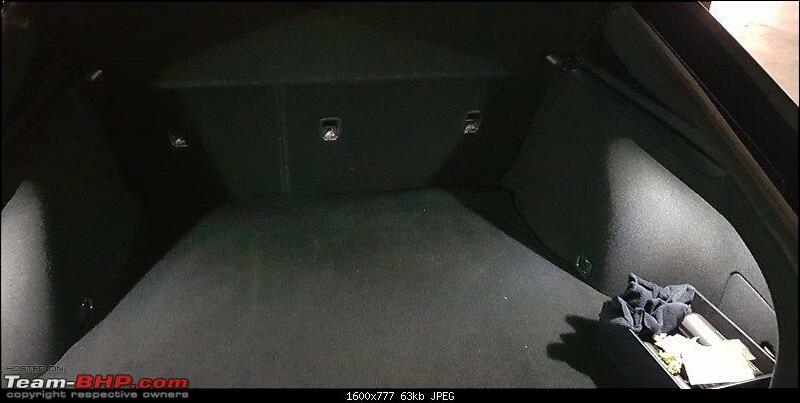 Two sub woofers are present under the two front seats. Note the double stitching on the leather. Rear seat leg room is adequate, but toe room is strictly minimal due to the positioning of the sub woofers below the front seats. Isofix slots on the outer rear doors. The lids of the isofix slots are push down which means they don't get lost when installing a child seat. The seats are cooled and heated. The toggle switches can be pulled down to activate cooling, or pushed up to activate heating. Then the switch needs to be moved in the same direction to vary the intensity of the cooling / heating. Both cooling and heating are very effective. Last edited by bharat4ever : 10th February 2019 at 18:31. The 8 inch infotainment screen is crisp and bright even in bright sunlight. The touch screen is capacitive and is precise. Navigation map can be made full screen. The map is full of detail and is in HD. 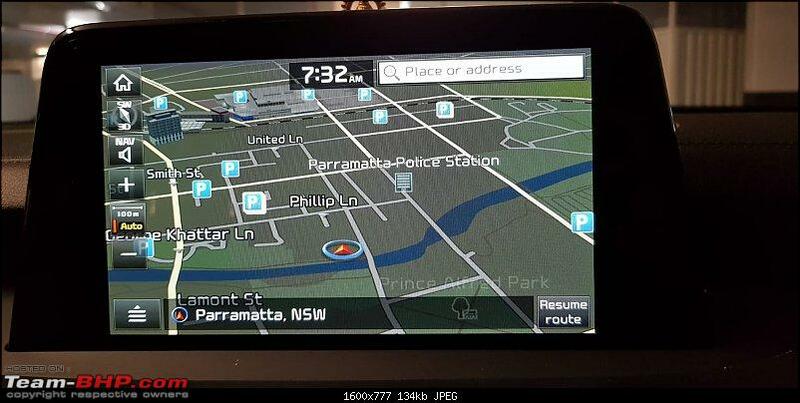 The Navigation software is good too with warnings for speed cameras, changing speed limits, school zones. It also contains information about KIA service stations, Parking lots, Fuel statations, resaurants etc. Detail is not lost when navigation is displayed only one half the screen. 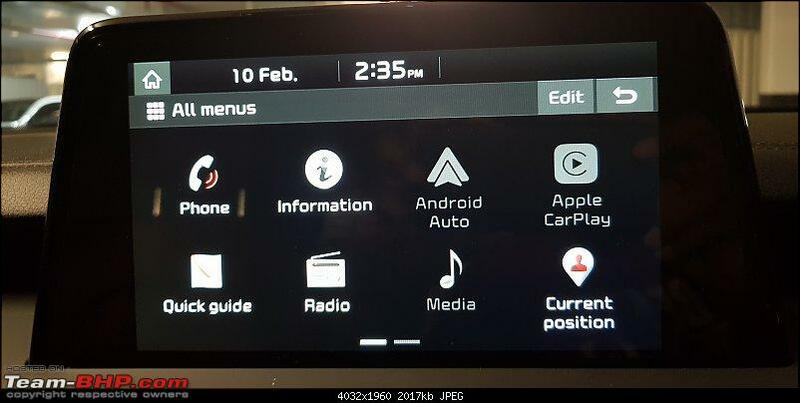 Note that the other half of the screen can display media information, either as satellite radio, USB media, or Apple CarPlay / Android Auto. Audio is supplied via a 15 speaker Harman Kardon sound system. The system contains 1 tweeter, 1 mid range speaker, 1 woofer in each of the doors. Also contains a center speaker on the dashboard behind the center screen, and two sub woofers under the front seats. The system also contains a few nifty tweaks. It provides a surround system where the occupants can imagine being on the stage where each instrument sounds from a separate speaker giving the impression of being surrounded by music. 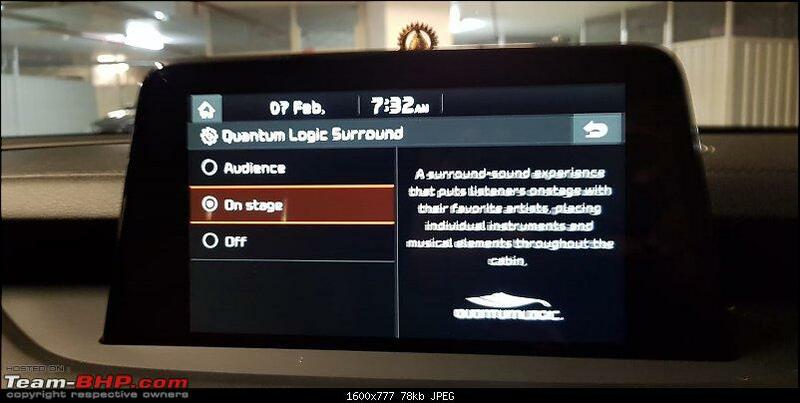 The system also has an audience mode where the surround is more centered in front of the occupants. Clari-fi is a patented technology which fixes the loss in lower quality music files like mp3s. The sound quality is mostly good. It is more bass friendly considering it contains 2 sub woofers. Turn the bass down, and the sound clarity is very good. It doesn't come close to the Bowers and Wilkins audio which performs duties in the XC60, but it's right up there for normal music listeners. 1. Eco - Upshifts as soon as possible with the suspension settings on comfort mode. 3. Sport - For very spirited drive where the steering becomes tauter, the suspension stiffens up and the engine upshifts only above 4000 rpm. 4. Smart - Monitors driving activity and decides the mode based on the driving input. 5. 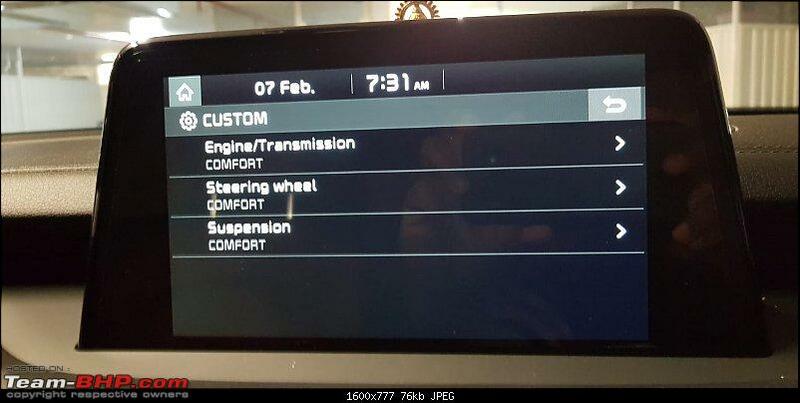 Custom - Allows the user to choose comfort / sport settings individually. 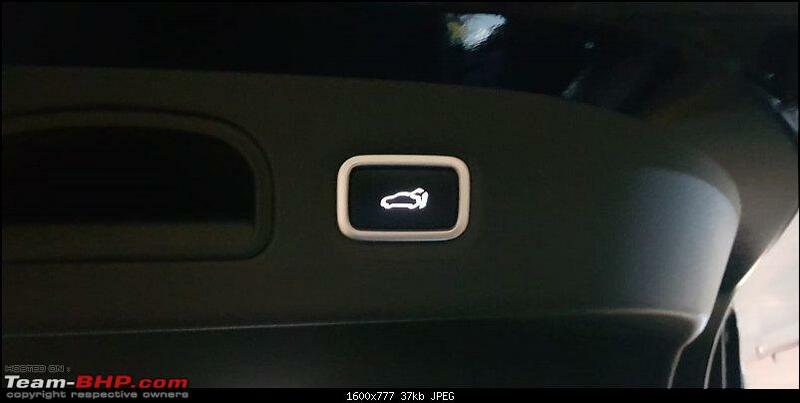 Also note button to switch off traction control to enable launch control. Auto Hold when enabled will hold on to the brakes when the vehicle is completely stopped. The accelerator will have to be depressed to move the vehicle and release auto hold. The shifter is drive by wire with a separate Park button. 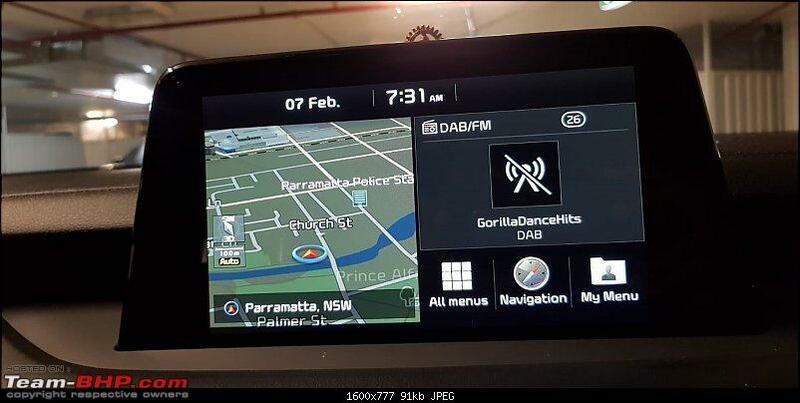 The car goes into Park automatically when the car is switched off. However, the Parking brake has to be manually enabled. The parking brake is disengaged automatically when the shifter is moved to Drive. 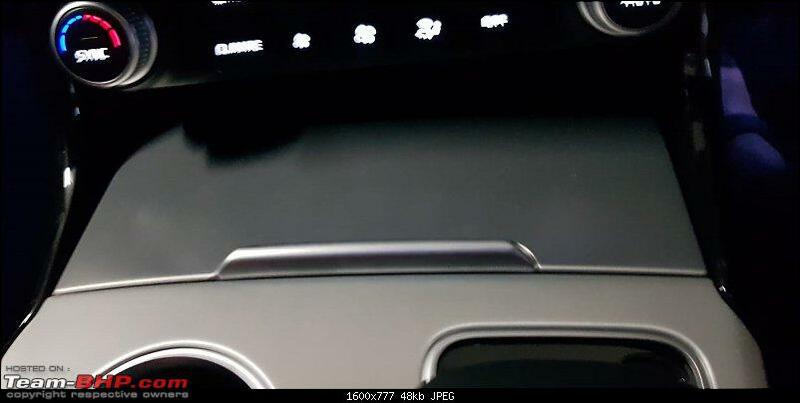 Also note buttons for enabling the parking sensors and switching on the 360 camera. 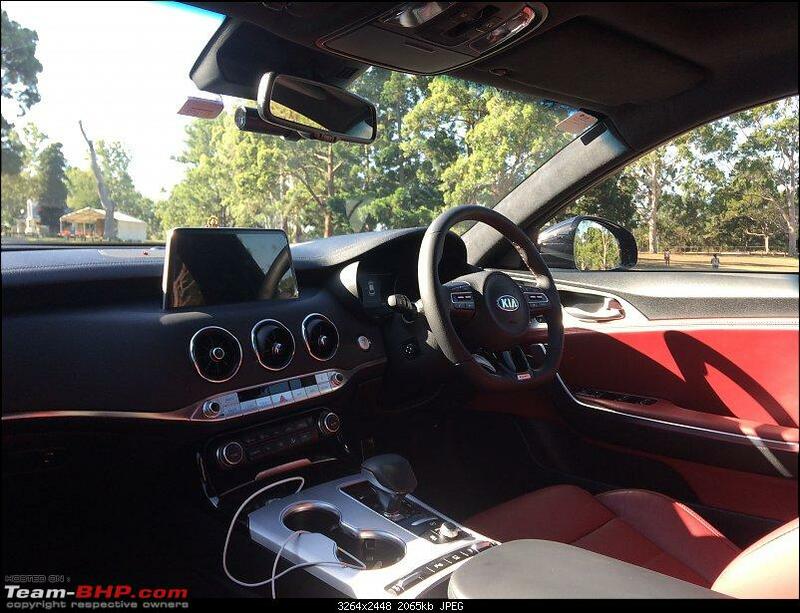 The Stinger also features artificial engine noise which is pumped into the cabin via the speakers. The intensity can be varied via the settings. This is more of a novelty factor since the real engine noise is strictly average, with no special exhaust note even though this is a V6 outputting 365 bhp. An alternate bimodal exhaust is available as a KIA accessory. 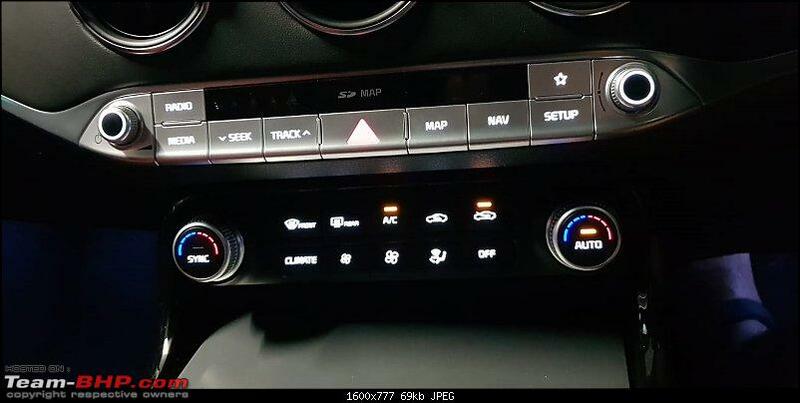 Infotainment and Air conditioning buttons are well laid out. The custom * button can be mapped to any action you choose. Air conditioning is a dual zone climate control unit, and is a pretty standard affair. 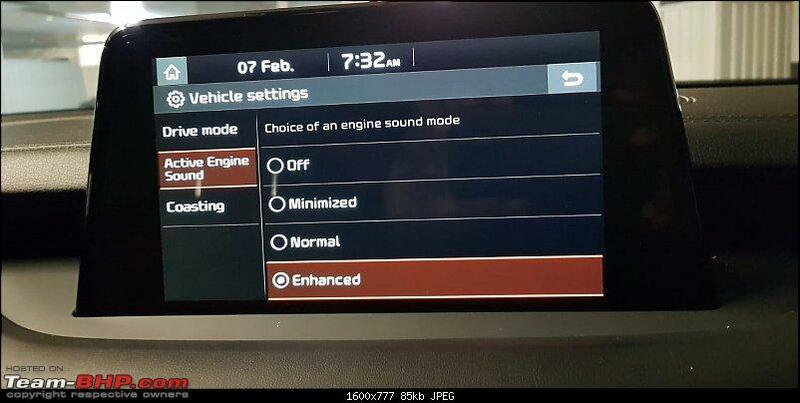 It also features an automatic defrosting technology which automatically switches on the front defogger if it detects fogging on the windshield. The switches on the knobs feels up market and smooth with none of them making clicking noises. 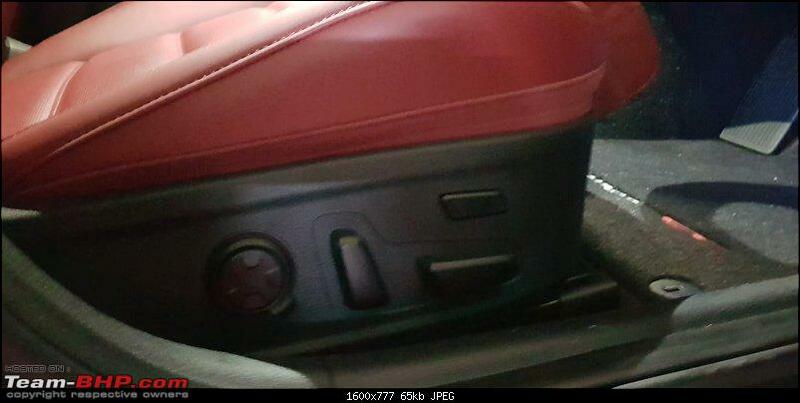 An additional storage area is available in front of the gear selector. When opened a 12 V port, USB port, AUX, and a wireless charging mat. The charging mat can be turned off in the settings if you need. 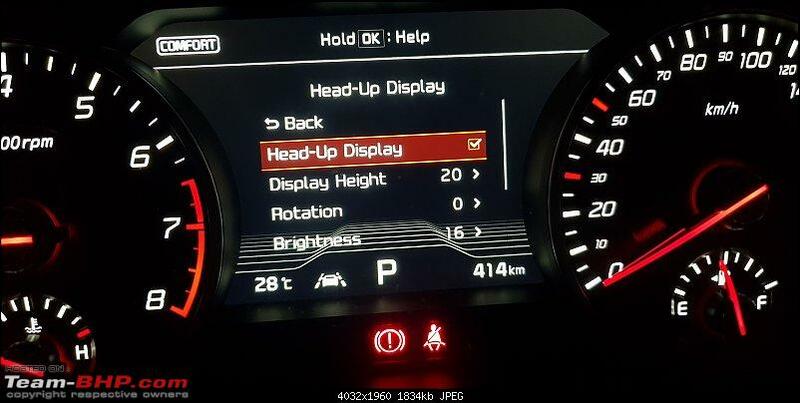 The Stinger comes with a standard run of the mill Heads up Display which is a projection of a reflection on the windscreen. 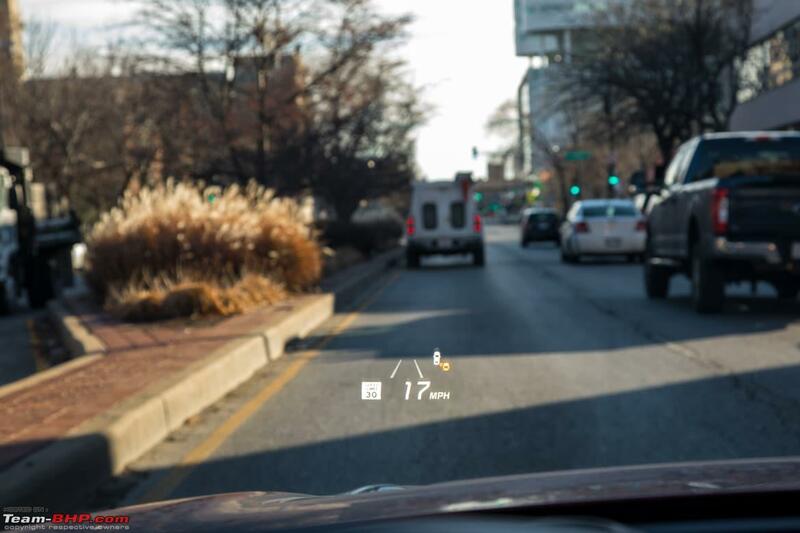 You get all relevant information on the windscreen including current speed, speed limit, navigation information, media information, and also rear blindspot proximity alerts. This is essentially useful that the driver knows what is in his blindspot even before turning his head. 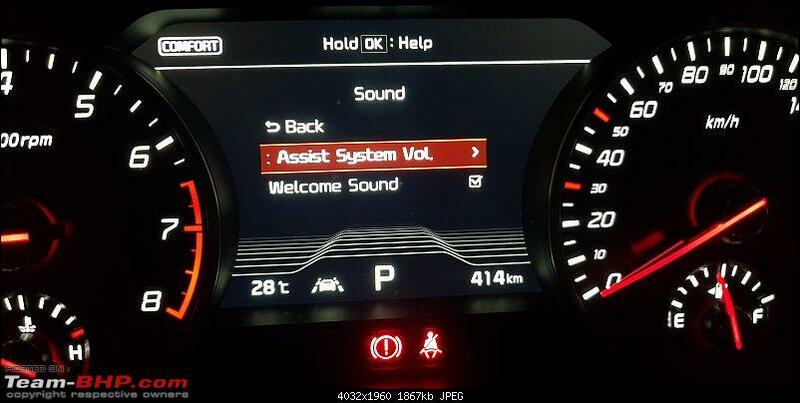 The HUD also displays if the Adaptive Cruise control is switched on, what is the cruise speed set, and also whether lane keep assist is switched on. The display is crisp and bright. The brightness, angle and height of the HUD can be adjusting using the MID. Below is a stock image borrowed from a website since I did not want to take pictures during driving. 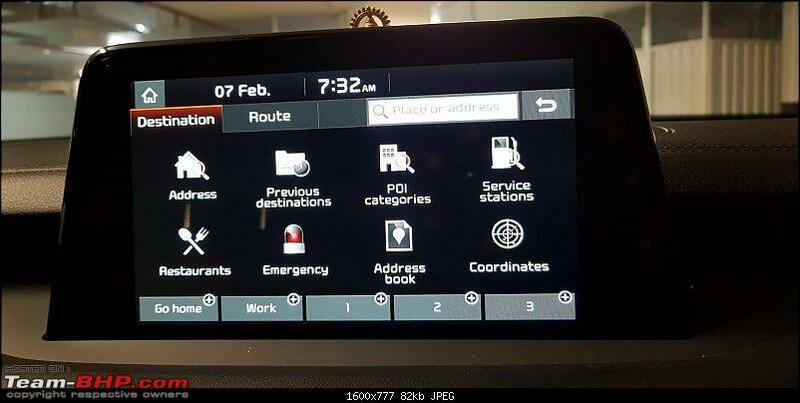 The MID is a 7 inch "supervision" cluster which has several screens. If the Stinger is used on the track, there are three separate screens for which currently I have no use for. HUD adjustments can be made using the MID. HUD can be turned off altogether if it is a bother. Height and brightness also can be adjusted. Can be rotated also! Doors can be set to auto lock once the car is put into Drive. Alternatively the doors can be auto locked once the car accelerates. Doors can be unlocked when the car is put into Park, or when the driver's door is opened. The Power tailgate can be turned off for some reason! 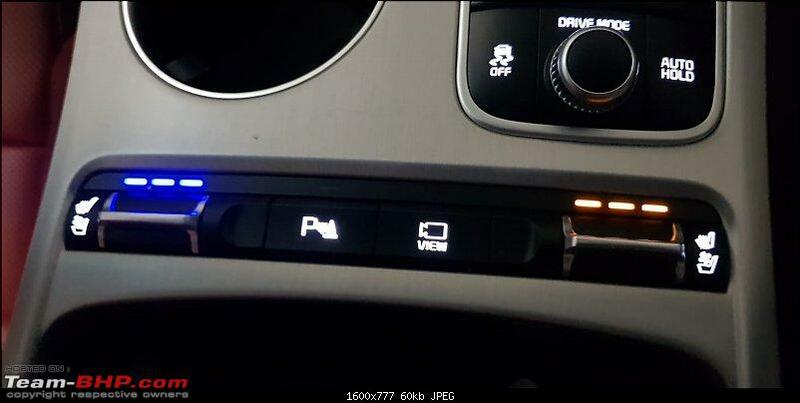 The one touch lane change turn signals can be customized regarding how many times the turn singal flashes 3,5, or 7. The ambient lighting can be turned off altogether if it is too distracting. 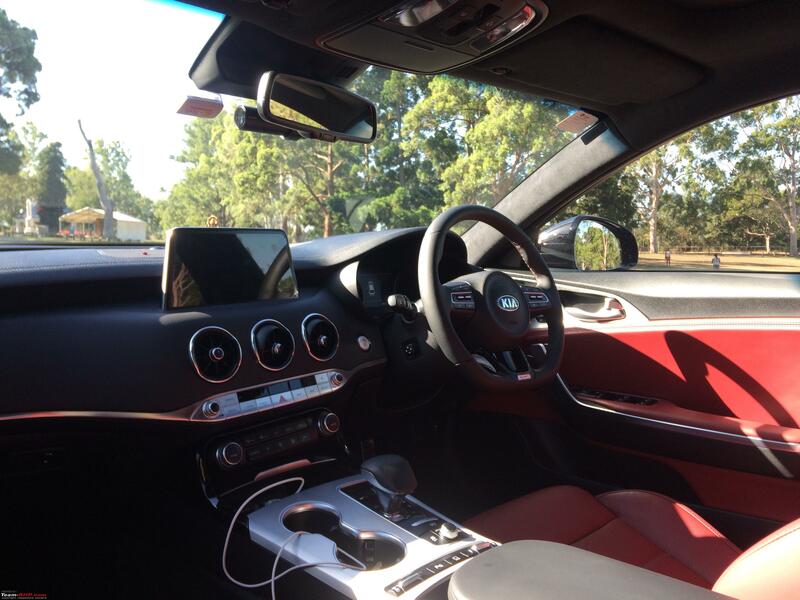 The Stinger plays a welcome jingle everytime the car is unlocked and the drivers enters the car. It also plays a good bye jingle when the car is switched off. Novelty sure, but a welcome addition. It's a relief it can be turned off if it gets too annoying. 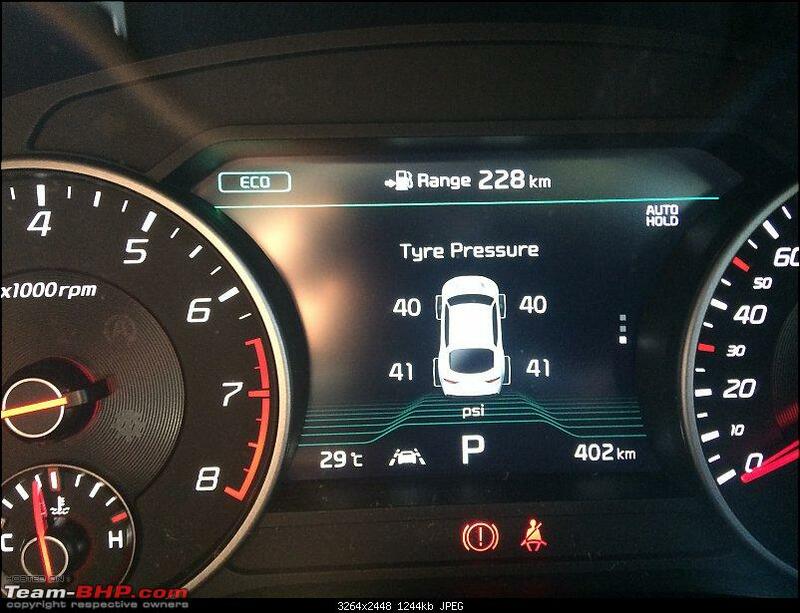 The Stinger has Direct Tire Pressure Monitoring System which is more or less accurate to 1 psi. 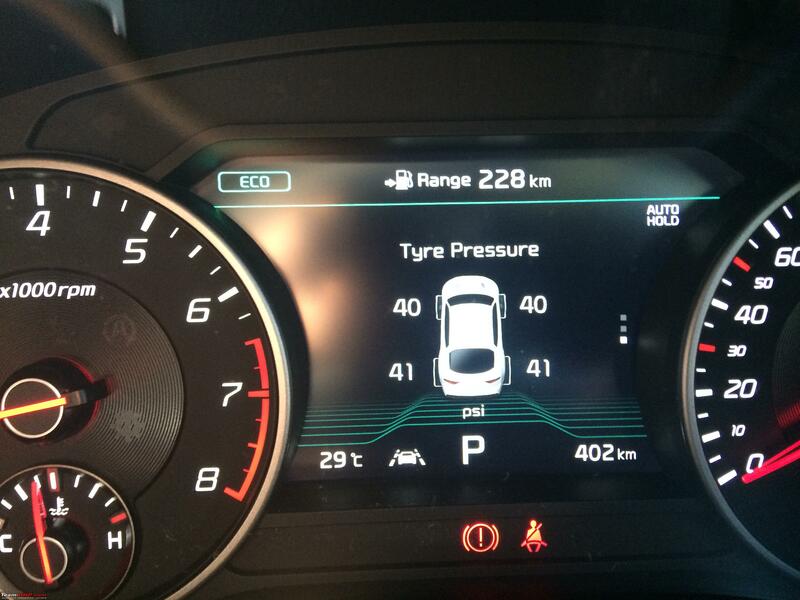 The pressure of each tire is shown on the MID. The system also displays a warning in case of large loss of pressure compared to the previous reading. 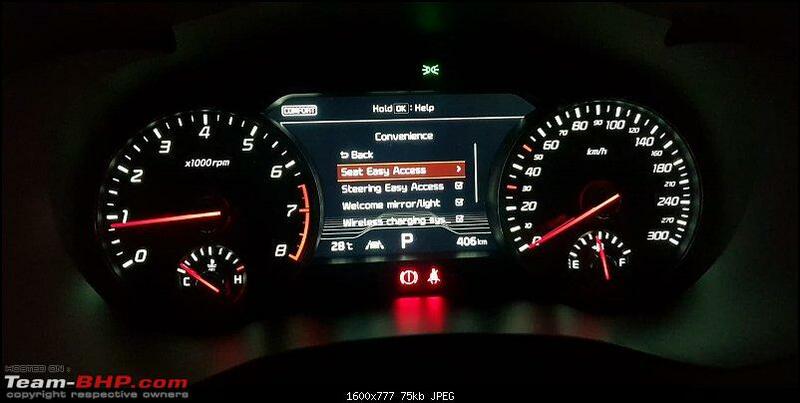 Note also that Auto Hold and Lane Keep Assist are active. 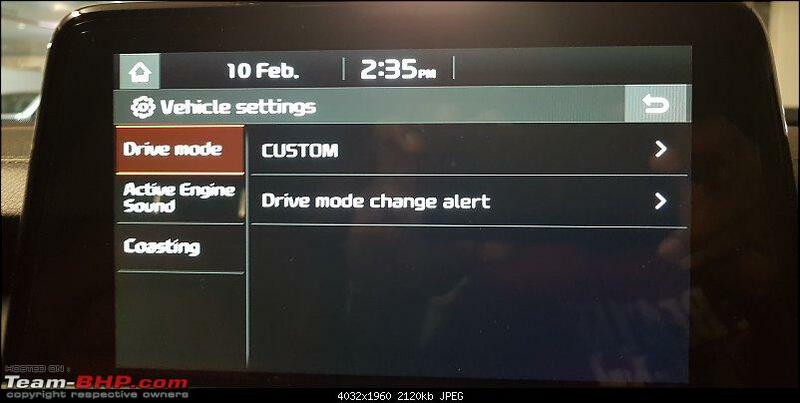 Also displayed is which driving mode is currently in use. The MID also goes one up on the German counterparts on the driver alertness monitoring system. While other systems generally tell the user to take a break, the Stinger shows a graph as to how alert the driver is, and when the last break was taken. Gimmick or not will have to be tested though. The instrument cluster itself has old school analog dials to denote RPM, speed, temperature and fuel. The rest of the display in the middle is digital with warning lights strewn across the analog cluster. The dials are neat to look at and are crisp. 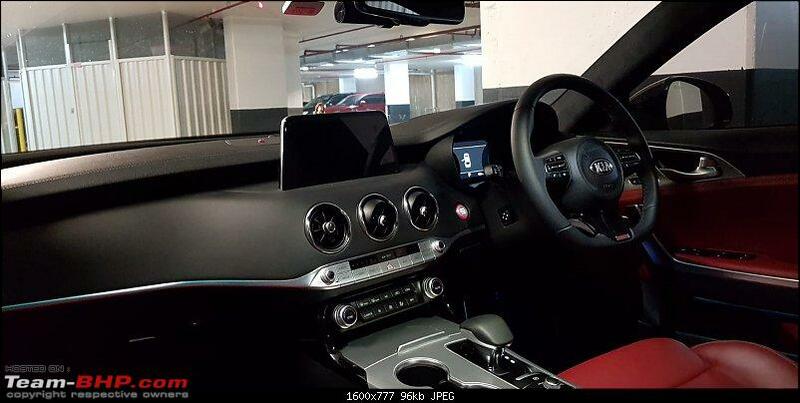 This top end model Stinger also features a 360 camera which lets the user see a birds eye view of what is around the car. 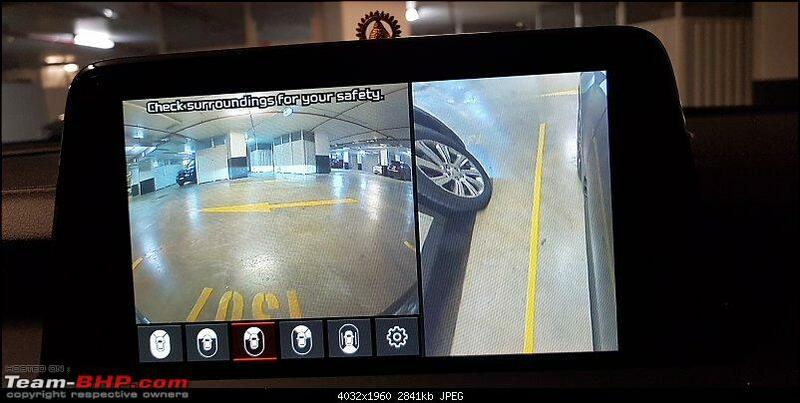 The camera system activates automatically when Reverse is engaged. It also can be manually activated at low speeds. 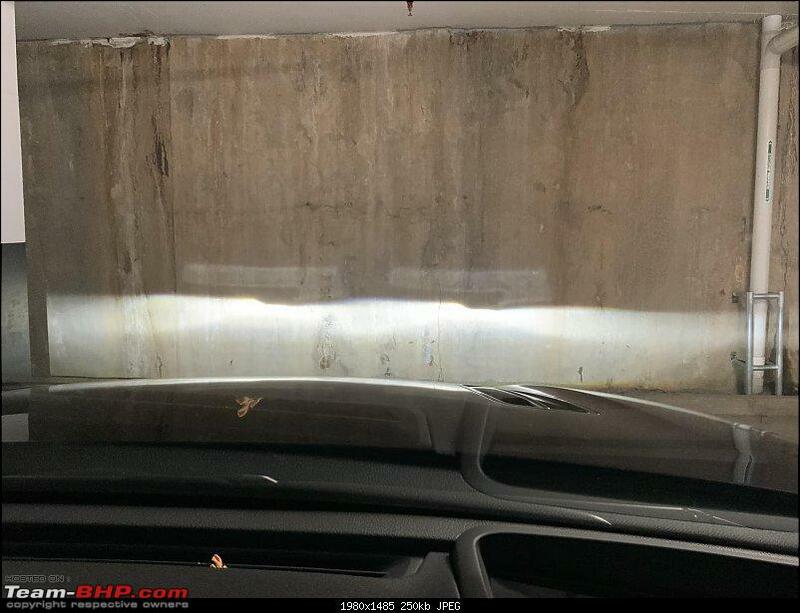 At higher speeds, only the reverse camera can be activated which serves as an IRVM since the view out the back is abysmal. 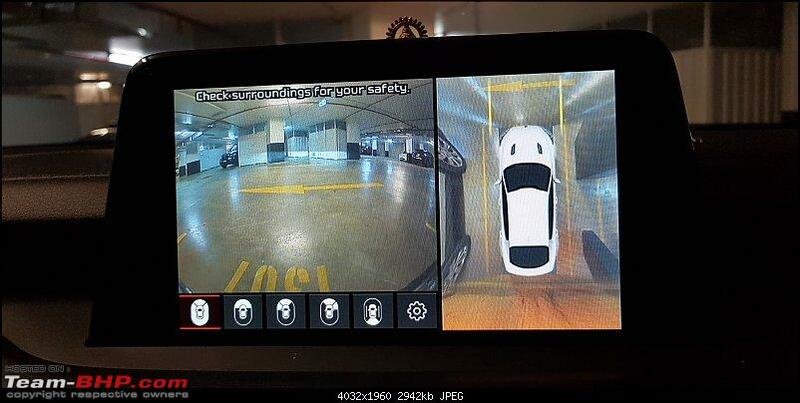 You can also zoom in on any of the cameras to get better control of where your wheel is, to avoid the curb, to park as close to the wall behind etc. The system uses four cameras for this purpose. On the boot lid, on the front grill, and two cameras on each ORVM. The Cameras on the ORVM swivel to look forward or look backward depending on which gear is engaged. Normal view when the camera system is engaged when the car is in Park on in Drive. Last edited by bharat4ever : 11th February 2019 at 06:16. The Stinger features a plethora of Modern safety features a few of which I have detailed below. The car produces 365 BHP, all of which are sent to the back wheels. With 500 Nm of torque, it's highly likely that the wheels will spin off the line under hard acceleration. 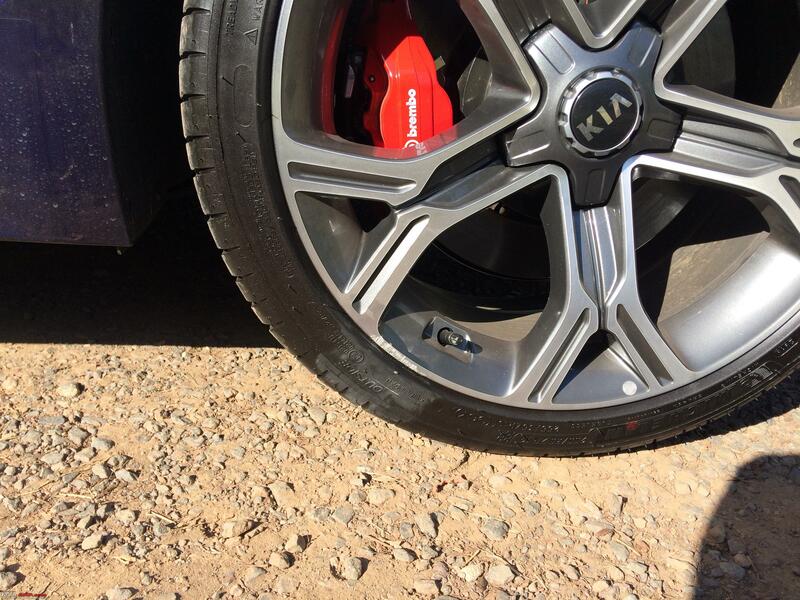 The Traction control system limits that enables a smooth release off the line with minimum wheel spin. The Limited Slip Differential helps in keeping the car pointed forward when driving spiritedly on the curves and ensures that the car doesn't end up in a ditch somewhere. With that said the Stinger is still tail happy and is willing to fish tail out on slightly gravel tracks where the LSD immediately brings it in control again and off the car goes to conquer the next curve. With incredible torque at low RPMs, this car is incredibly fun to drive. The tail happy nature also puts a big grin on your face, knowing that the LSD is there to save the day. The ORVMs and the IRVM are both auto dimming and ensure that high beams are not too much of a distraction. 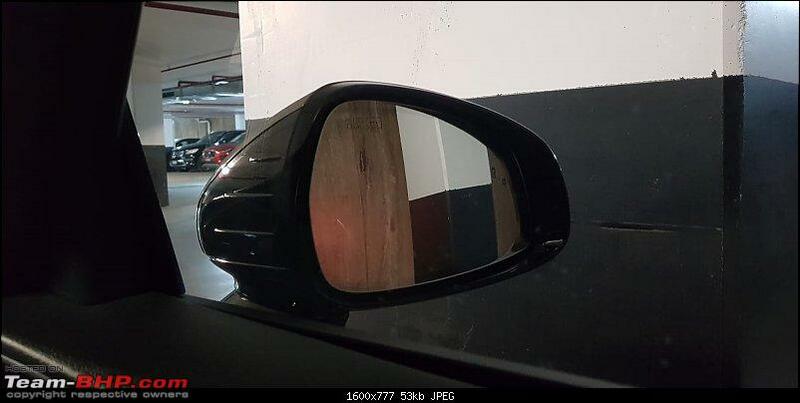 The mirrors use a electrochromic system where the light falling on the mirrors is measured and then a dim layer forms on the mirror. The Stinger features autonomous emergency braking which brakes the car automatically if it detects an obstacle in the immediate vicinity. 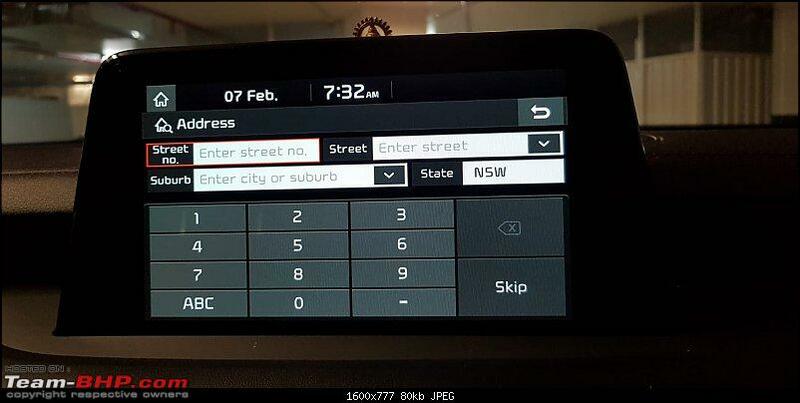 It also detects pedestrians and will brake automatically. 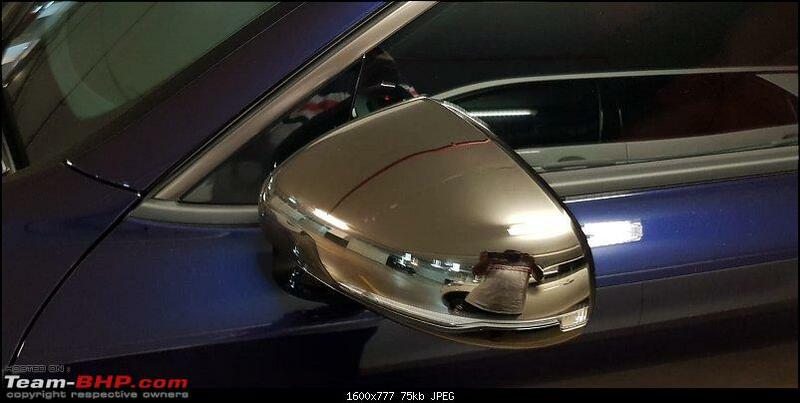 If a collision with a pedestrian is inevitable, the car features Active Hood Lift system which raises the hood slightly to cushion the impact for the pedestrian. 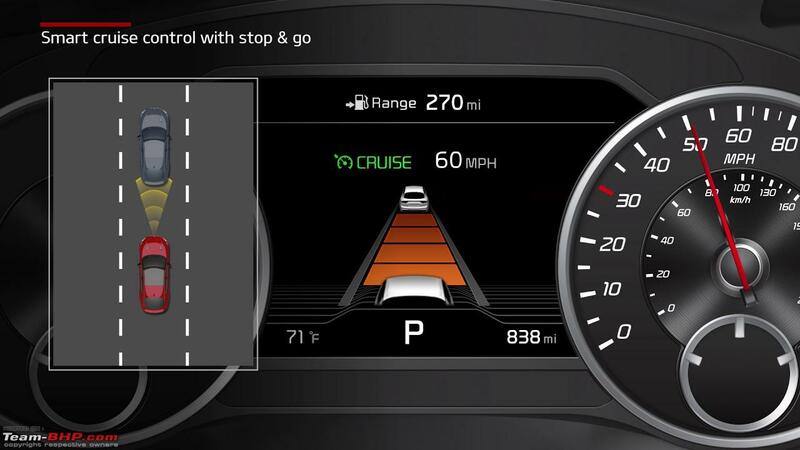 The Lane keep assist can actively steer the car to keep it in the middle of the lane. This assist activates at speeds above 60 kmph, and activation of the system does not depend on whether the cruise control is activated. 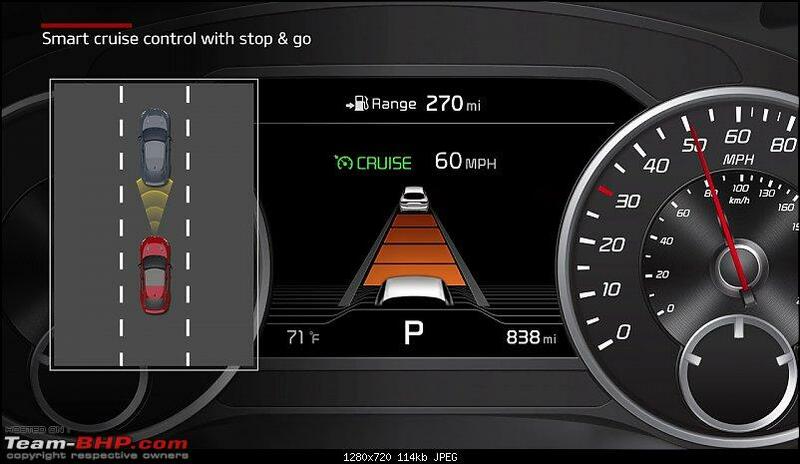 There are varying degrees of the Lane Keep assist which are configurable. At it's minimum, the car only lets out an audible warning to the user if the car detects that it is moving out of lane. In the mid configuration, the car gives gentle steering inputs to try to keep the car in the center of the lane, and with the maximum configuration the steering inputs are more frequent. In the maximum configuration the car feels like it is bouncing off one lane to the other in an effort to keep it in the center of the lane. The car constantly flashes its brake lights and hazard lights if a sudden brake is applied which activates the anti lock brake system. The emergency stop signals signal to the driver behind that the car had to apply emergency braking to avoid an obstacle, and it continues until the brake force is released and the car accelerates. 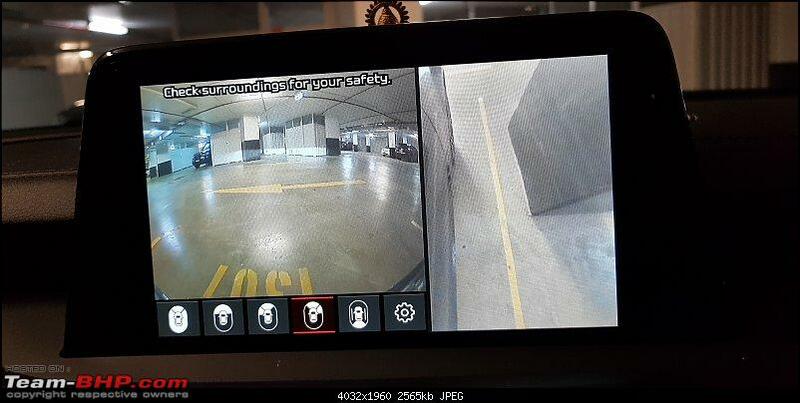 The Blind spot detection warns the user of another vehicle in the driver's blind spot in it's close proximity. a small light lights up in orange on the ORVM where the blind spot obstacle is detected. A similar warning comes up on the HUD as well. An audible warning is chimed if the turn signal is turned on to change lanes when an obstacle is detected in the blind spot. Rear cross traffic alert is useful when the car is being reversed from a vertical or 45 degree parking and it is reversed on to the street. 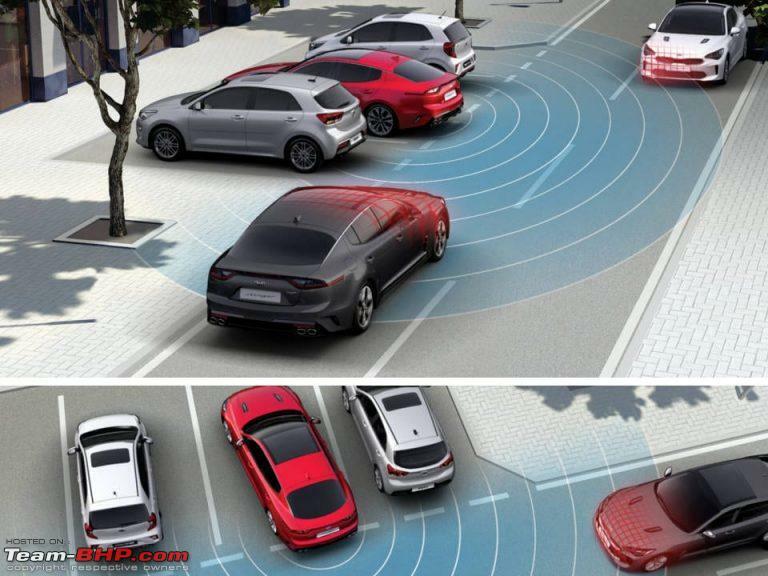 The system uses a sonar which is able to detect cars coming on either direction to an extent where the driver is not able to see the car. Sales speak for adaptive cruise control where the car is capable of maintaining the set cruise speed, and also reducing the speed based on the vehicle in front. 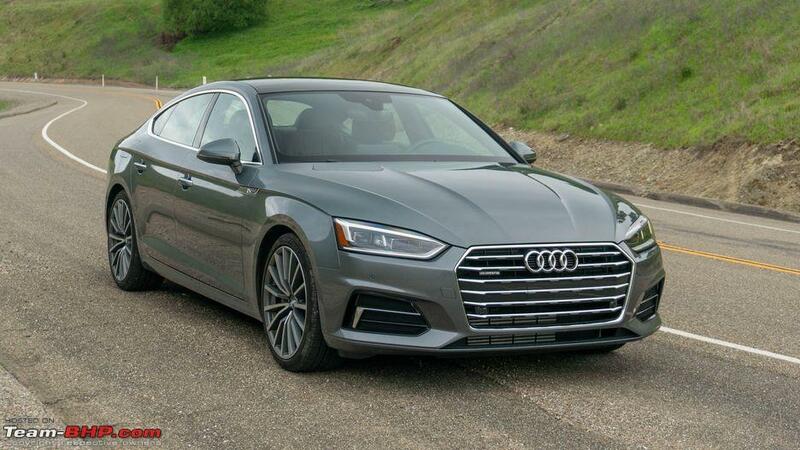 The speed reduction can be till a standstill in case of a stop sign, and flicking the RES button of the cruise control resumes the adaptive cruise. 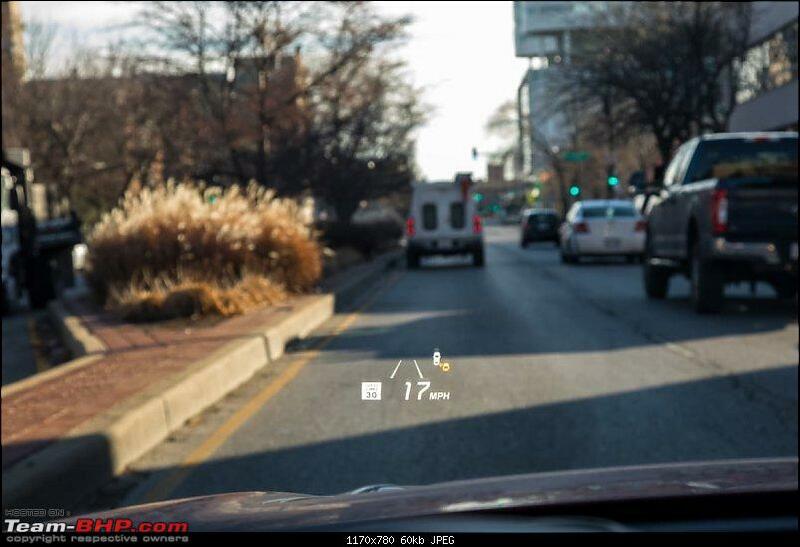 The distance to be maintained between the car and the vehicle in front is configurable and can be changed in real time. 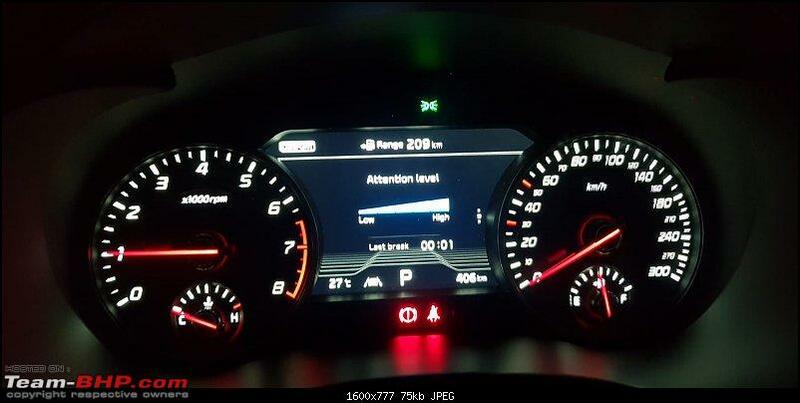 As usual you use the SET button to set the cruise control speed and reduce the cruise speed. RES is used to resume the cruise control and increase the cruise control speed. It works well most of the time, with the acceleration and deceleration linear without any jerks. However, when the cruise control is on when the car goes round a curve, and suddenly a vehicle in the next lane enters the frame of the radar, the car detects that there's an obstacle very close to it and it suddenly brakes. It is disconcerting at best, and very dangerous for the vehicle behind. 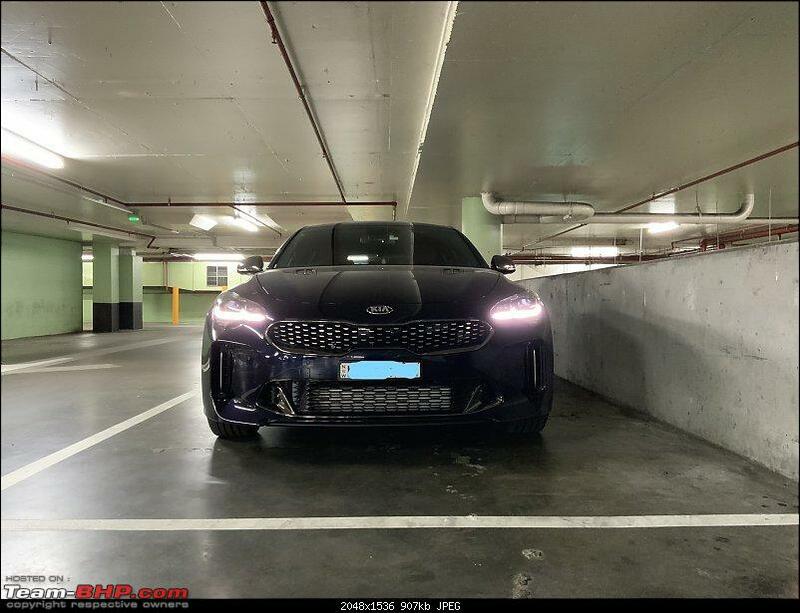 This top of the model Stinger gets front and rear parking sensors with the graphic integrated into the infotainment system. The rear, front and the rear cross traffic alert all get their own unique sounds so that you do not mistake the warning sound. 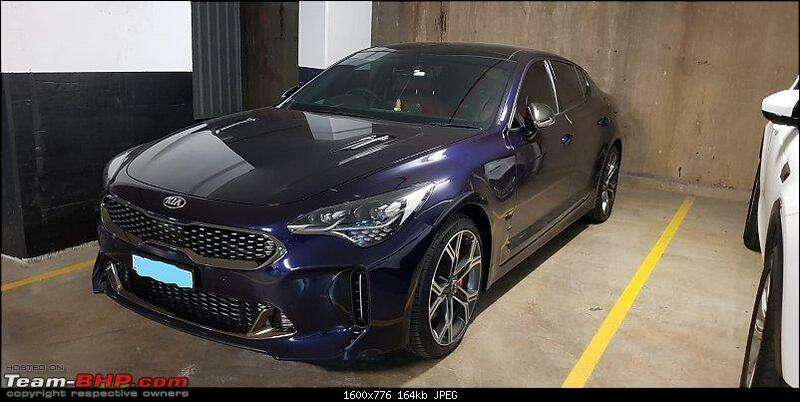 The KIA Stinger GT houses a 3.3 liter V6 twin turbo engine producing 365 BHP and 510 Nm of torque. The engine is rated to run using regular unleaded petrol. However to get maximum output from the engine a minimum of 95 RON petrol is required. 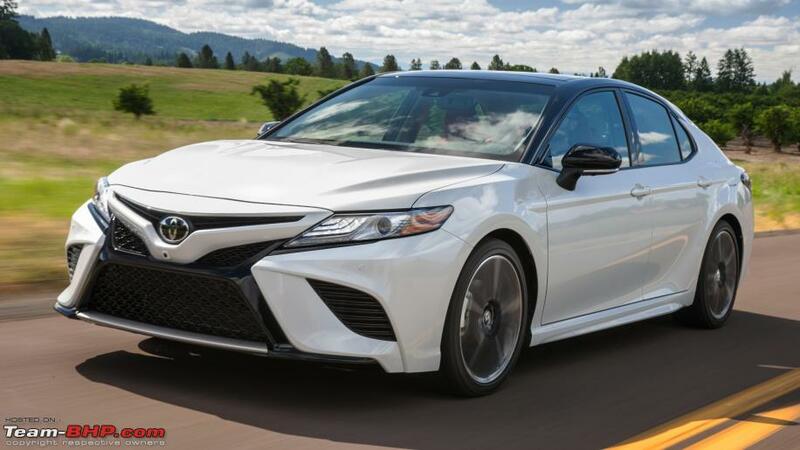 The engine is smooth and refined even at high RPMs and hardly produces a hum inside the cabin. The flip side of this is that there is no grunt from the V6 engine and the exhaust note is disappointing. KIA offers a bimodal exhaust as an accessory, but even this exhaust doesn't hold a candle next to an AMG exhaust. Aftermarket exhausts are an option but whether this voids the warranty or not, is not exactly understood currently. The engine sits longitudinally and most of the engine is behind the front axle. This leads to a near perfect 50:50 weight ratio and keeps the heft of the car in check. The Stinger comes in at a weight of around 1.8 tonnes which is no mean thing. But the weight ratio, combined with the push from the rear wheels, the car hides it's bulk well. With a turning radius of 11.2 m the car feels smaller than it is. Additional support bars to hold the engine bay together. All variants of the Stinger use the same torque converter automatic transmission. 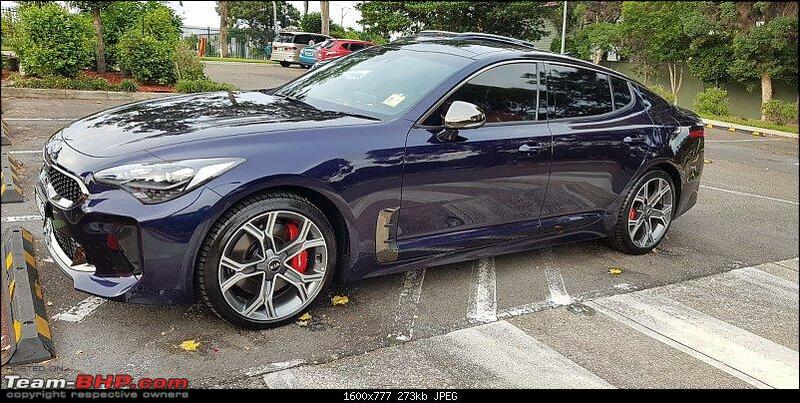 However this Stinger GT uses a shift by wire lever which is not physically connected to the transmission. This means that there is no true manual, like in case of a triptronic. Even manual paddle shifted gear changes are controlled by the software. True manual is achieved only for a few minutes after which the software overrides manual input and puts back the gear shift to Drive. If the transmission is left to do its thing and is in fully automatic mode, the upshifts and downshifts are effortless and are not noticeable. Dare I say DSG-ish. That being said, I am still to discover how to see the current gear on the MID. Right now it just says 'D'. 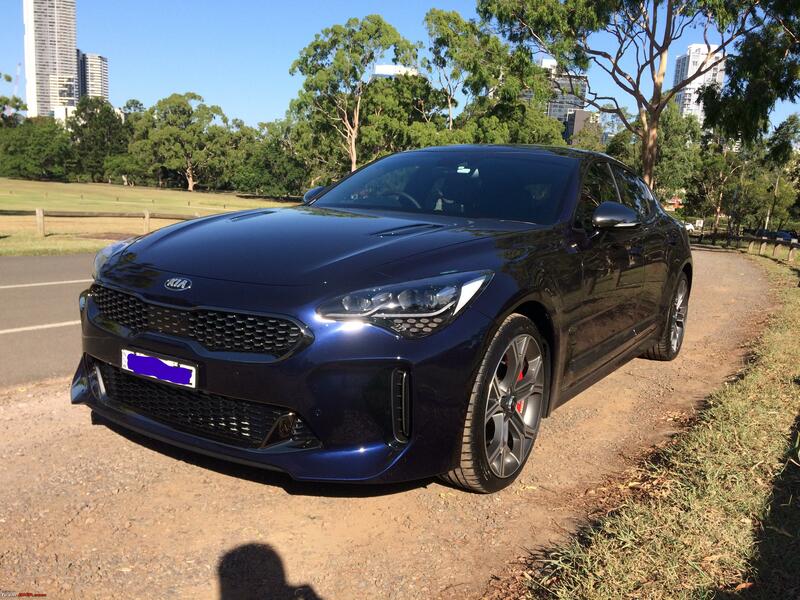 Coupled with the fantastic transmission and the immense torque at low RPMs the Stinger is a missile off the line. For normal day to day scenarios, launch control is not required. Mileage is something which is spoken in a hush hush voice around this car. When you start the car and you are navigating at low speeds around the parking lot to exit, the average fuel consumption says 2-3 kmpl! Extra urban driving yields a mileage of 7-8 kmpl and highway mileage is around 12-13 kmpl. * The boot is bare bones with no bag hooks and no 12 V socket. 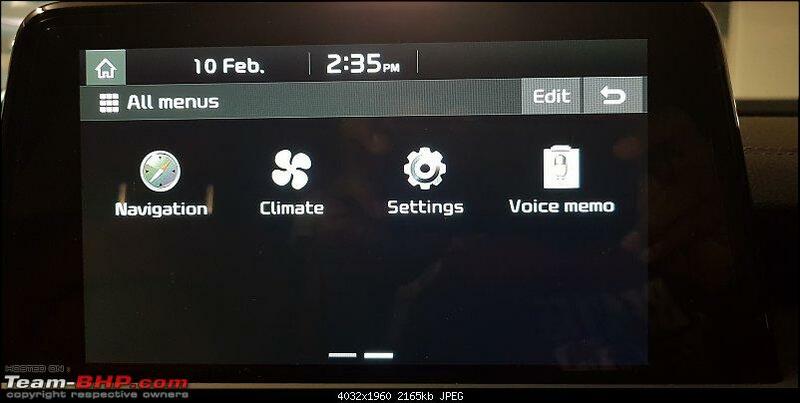 * Every time the infotainment system is switched on and the car is not started after a while, there is a scary warning that the battery is discharging! 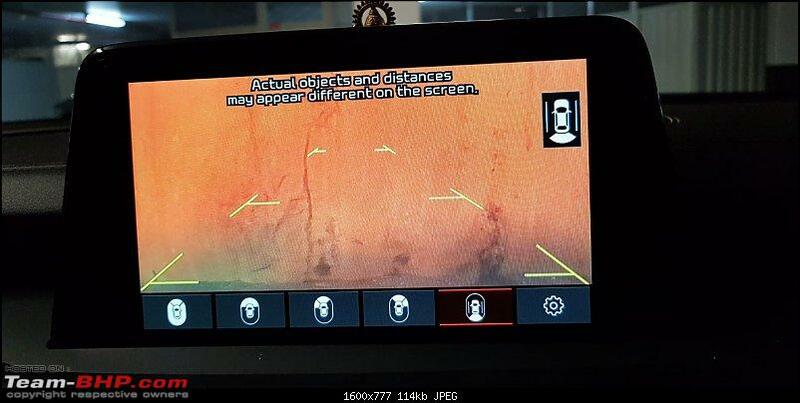 * When a dash-cam is connected, and the dash-cam operates even when the car is parked, the next time the car is started there is a warning stating that an external device is discharging the battery. * Build date is prominently displayed under the hood. * GT branding is on the front seat head rests. GT Branded carpet mats and boot mats are also available as an accessory. 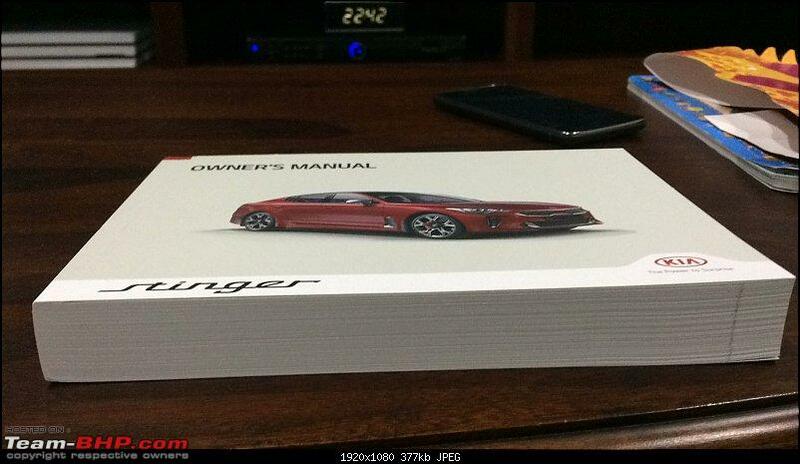 * The user manual is huge! So is the length of this ownership thread. 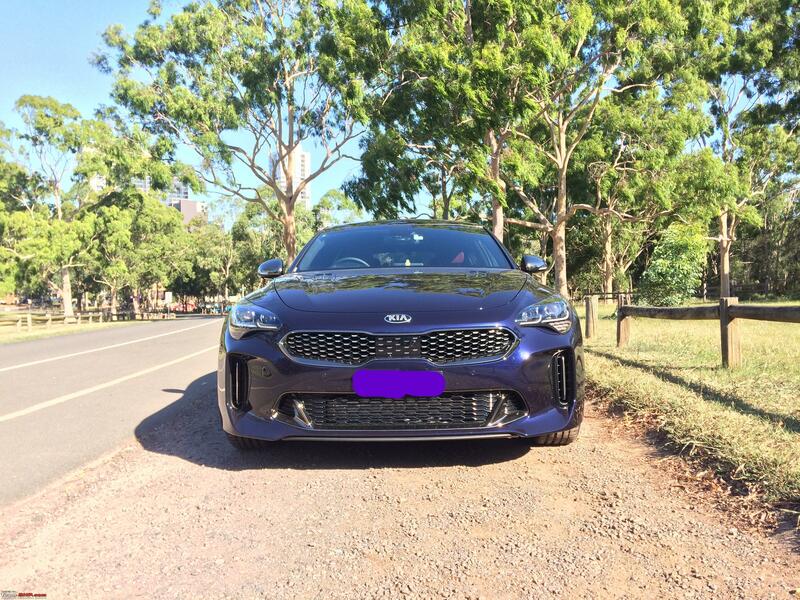 * Though the Stinger in Australia features a KIA badge, they get an E badge in Korea. Translates to "Engineered for Excellence". 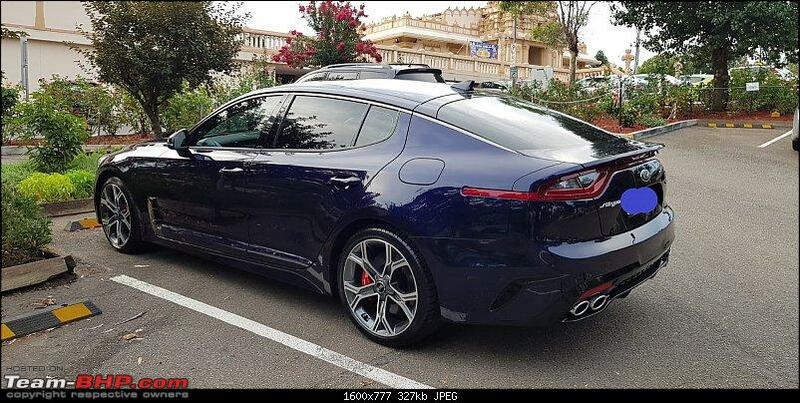 * Like all performance sedans the Stinger also features a kick-down mechanism where you push the accelerator pedal down beyond the 100% limit which makes the car drop another gear. 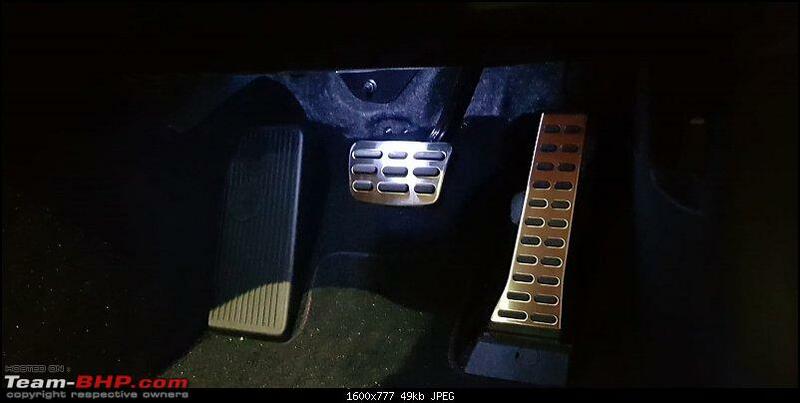 Useful for super quick acceleration. * The wipers have to be set to service mode before they can be moved away from the windscreen. * There are no hooks in the boot to hold up the mat while you pick up the spare wheel. * HUD is polarized. Wearing sunglasses of opposite polarity makes the HUD invisible. That's all from my ownership thread. Thanks for reading and getting this far. I am happy to answer any other question. Last edited by bharat4ever : 11th February 2019 at 12:17. Great ownership report. Wish you many miles with the beauty. The color is amazing. Awesome looking car dude. Many congratulations!! Ha ha. I agree they are high end features. What I meant was that the HUD or the dual zone climate control are similar to the ones you get on any other which have them. 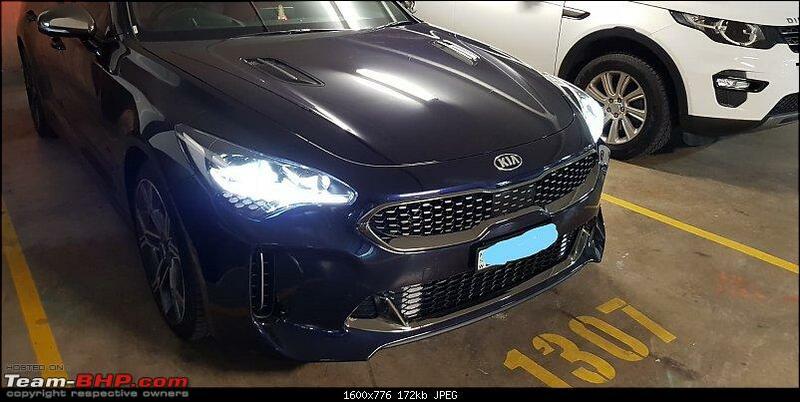 Meaning KIA does not have any other unique features on them. Congrats on the new buy mate! Purple colour is actually one of my favourites but it goes along well with a very limited number of things. Your car is one such example and it looks absolutely stunning. Enjoy your new ride. Congratulations on your Stinger! I loved the slightly modified Muhammad Ali's quote in this context. 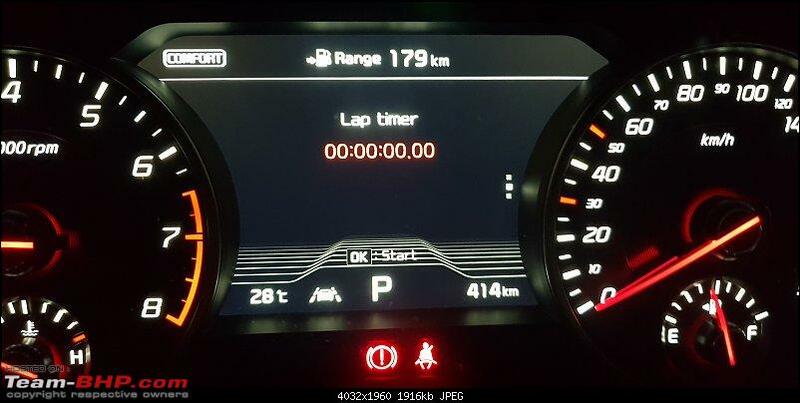 This ownership report of yours couldn't have come in at a better time as Kia is launching soon in India and Stinger could possibly revive the love for sedans and D2 segment when launched. Absolute delight reading your ownership experience. Great post! Spare wheel is bit of a disappointment! Engine bay looks neat and classy. 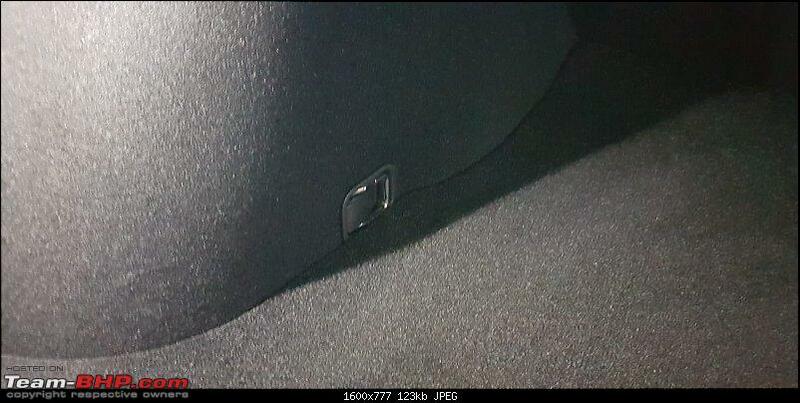 Wondering if the boot opens up every time you are around the rear of the car for more than 4sec, with your smart key in pocket? Even when you don't intend to use the trunk? Awesome report there. The Stinger is probably the only car which will make me go wow today. The design, alloys and the power - make it an attractive package overall. I'm glad Kia is coming to India as well. Cant wait to have a test drive of it once launched. I was expecting the V6 to sound sweet, but you mention that it is not special. Any video of it? I'm sure there would be after market options to fix it . Last edited by blackwasp : 12th February 2019 at 16:26. The quote is apt for this car. It's a sleeper GT car. Can be dormant and drive you around town at 40 kmph, no worries. But if you heavy foot the accelerator, it shoots off even before the passengers with you realize what has happened. 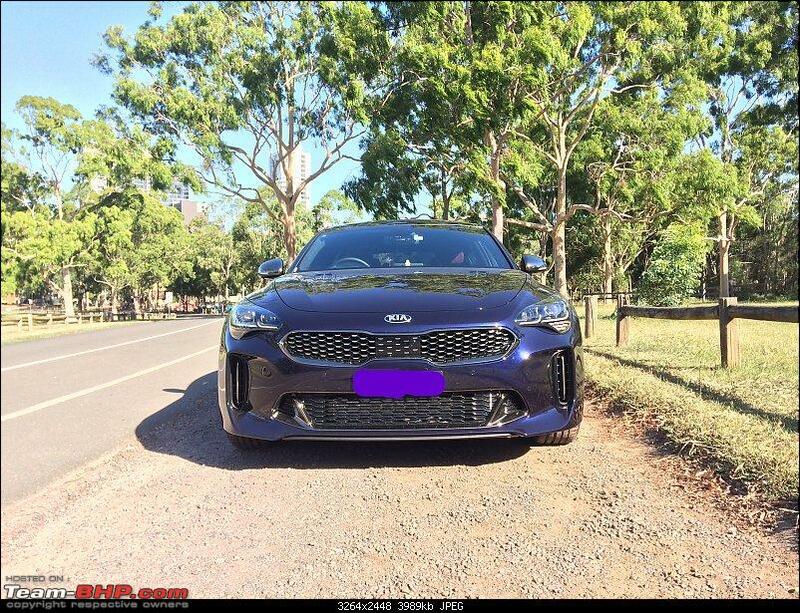 I hope KIA brings the Stinger to India. The enthusiasts will love it. But the pricing will make or break it. 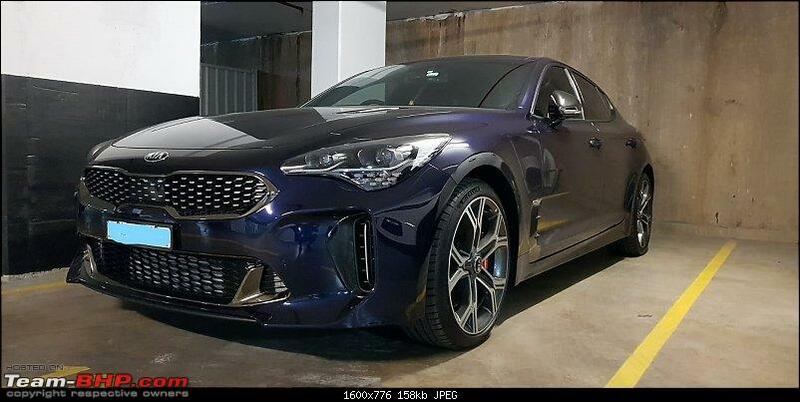 Here in Australia, the Stinger is priced on par with the Mustang, and the BMW 3 series and the Audi A4, at ~40 lakhs INR. I hope they don't think that the Stinger will sell in low numbers only and decide to import it as a CBU. We all know how the Mustang was priced. Here also it is a CBU shipped from Korea, but excise duty is next to nothing. Another thing is, i hope they don't skimp out on the safety features. This car is extremely powerful, and will lead to a lot of accidents if not driven right. In this review done in India, the reviewer takes it past 200 kmph, with no worry about who or what could cross the road at any moment. Engine bay looks good. 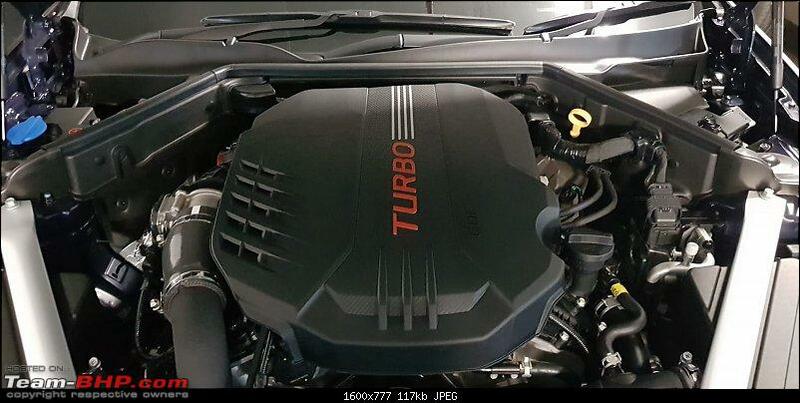 But I wish the engine cover says Stinger, or GT or something instead of "TURBO!". The boot gives out a warning of three beeps along with turn signal flashes. If you continue to hang around near the boot it understands that the boot has to be opened, gives two more beeps and then opens. If you move away before the three beeps, it does not open. 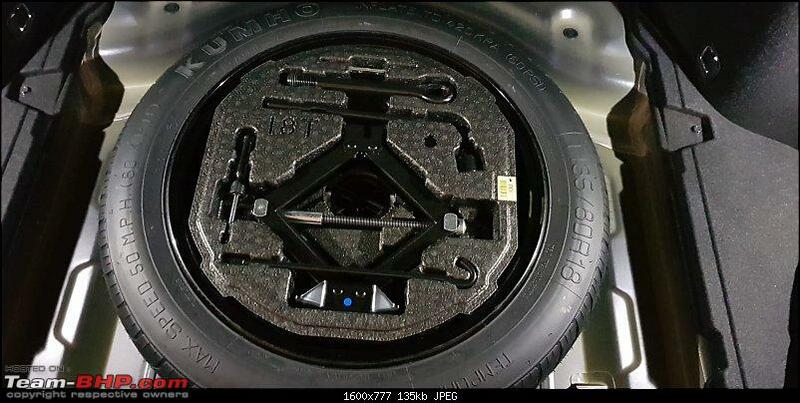 Also, about the spare wheel. Atleast Australia gets a spare wheel. The USA gets a tire repair kit. Yeah, but Kumho is odd and funny when the other tires are Michelins. Yeah the V6 sounds very toned down. But I don't mind since I bought this as a sleeper GT car and a daily driver. There is a bimodal exhaust supplied by KIA as an accessory. There are also aftermarket options which sound really sweet. Couple of things I forgot to mention in the review. * --- There are several variations in the models sold in different parts of the world. Possibly due to changes in local regulations, or cost cutting measures etc. 1. 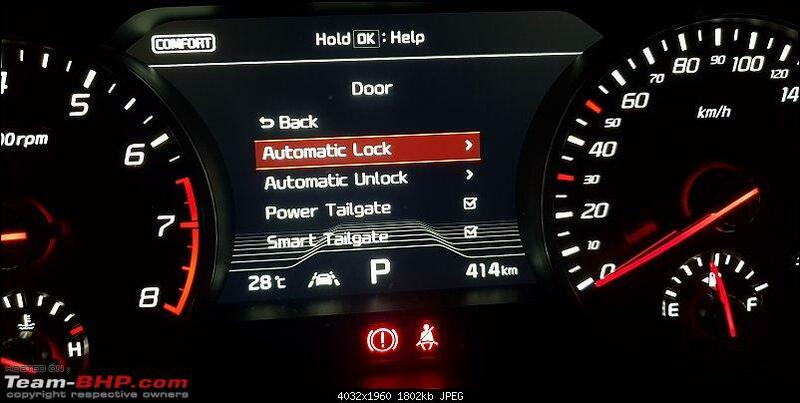 Canada gets a UVO app which can connect to the car to start the engine, check if the car is locked and lock it if not etc. 2. USA gets an ugly looking Amber reflector in the headlamp unit, compared to the rest of the world which is white. 5. Canada and the USA get a AWD variant because of the all the snow they get. RWD is more fun supposedly, but the AWD is better off the line due to the added grip. 6. USA does not get this color even as an option. 7. Australia gets their own locally engineered suspension to cater to Australian roads. 8. USA ( and I think Canada as well) get Harman Kardon headphones as a gift from KIA for purchasing the Stinger. * --- The horn sounds really bad. Like from a kiddy cart. Not really required here but if they definitely shound change the horn for India. Last edited by Gannu_1 : 14th February 2019 at 20:19. Reason: Minor typo. Congratulations mate. 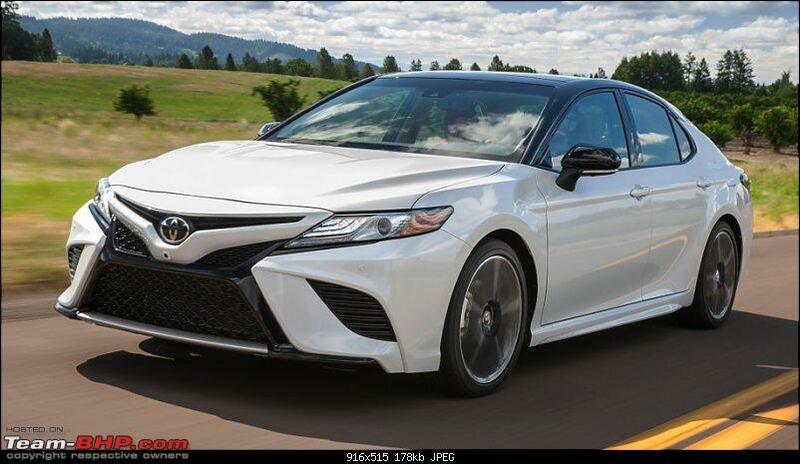 Nice review and a hell of car. By the way do you live in Parramatta, because I could see some pictures are of Parramatta Park and Murugan Temple. It would be nice to have a small Team BHP meet in Sydney. 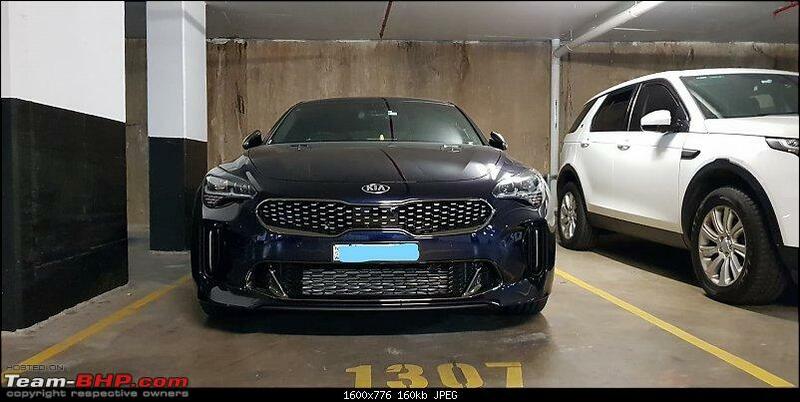 PS: I also own a KIA.